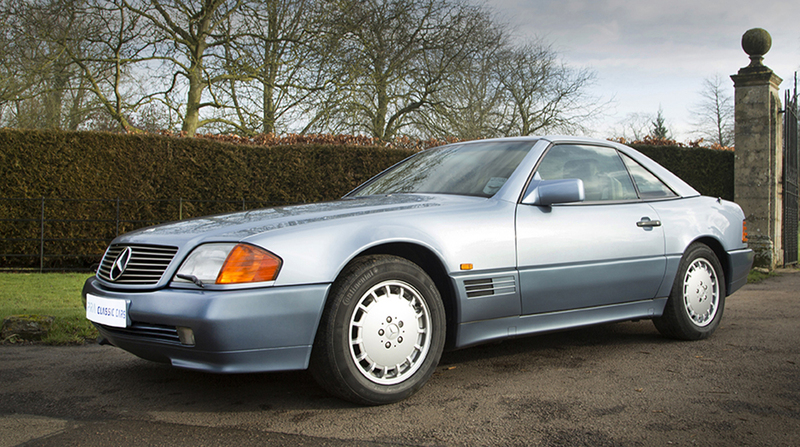 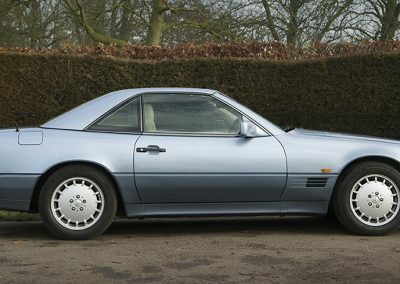 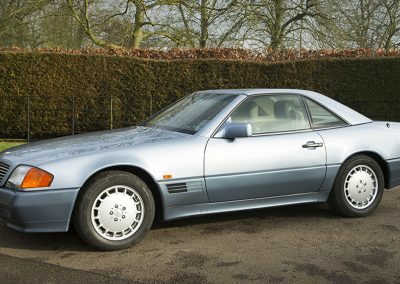 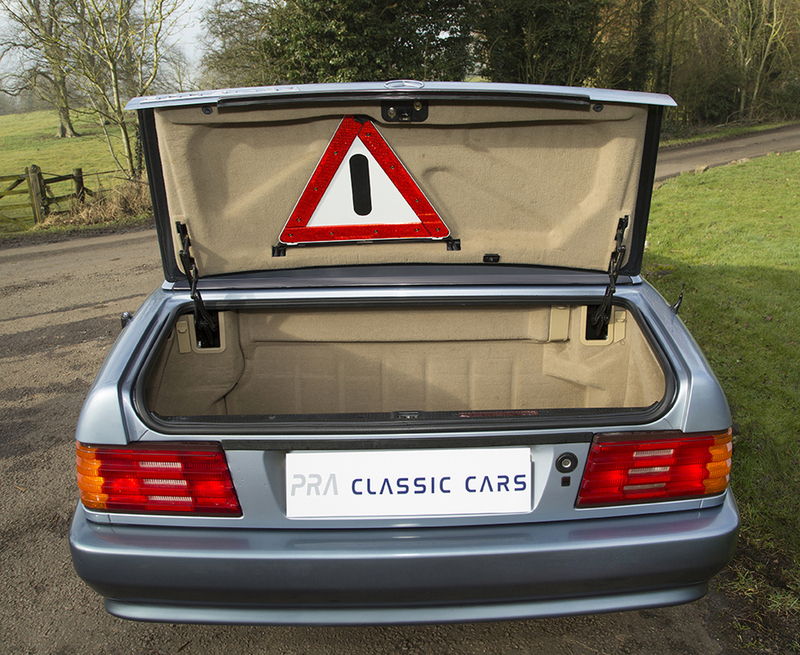 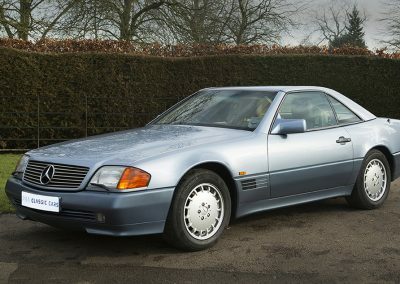 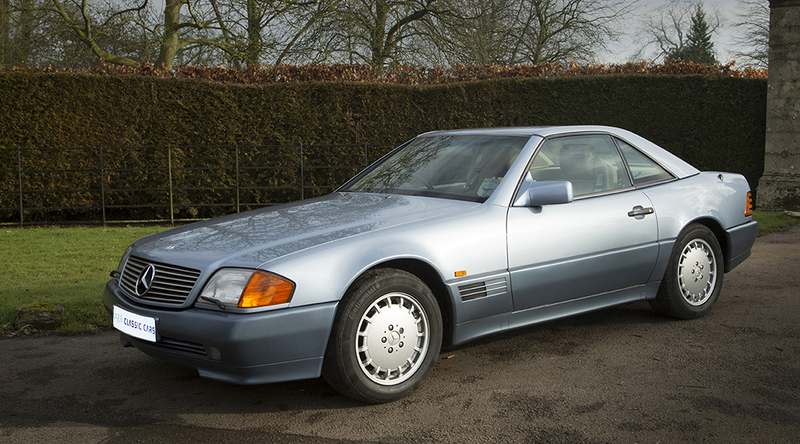 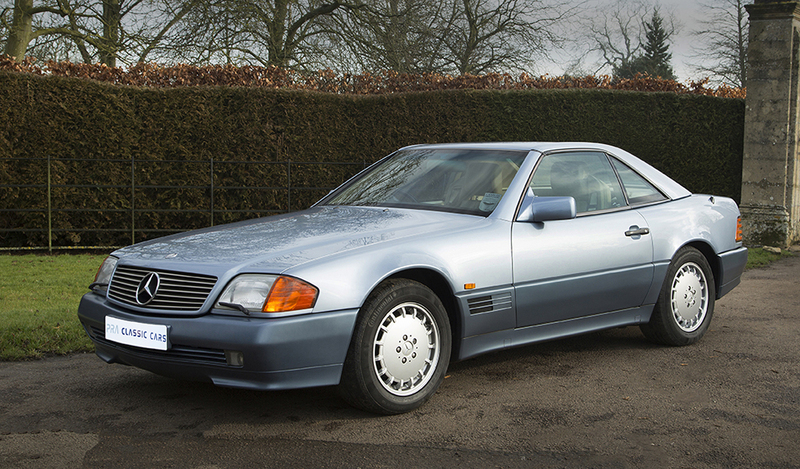 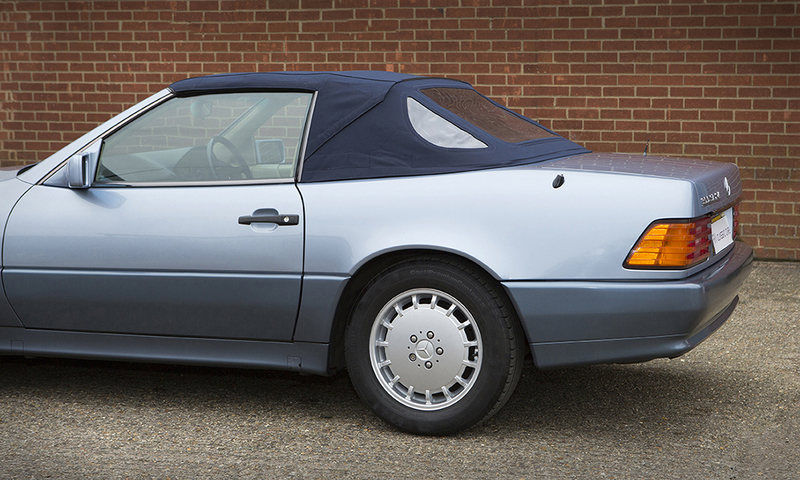 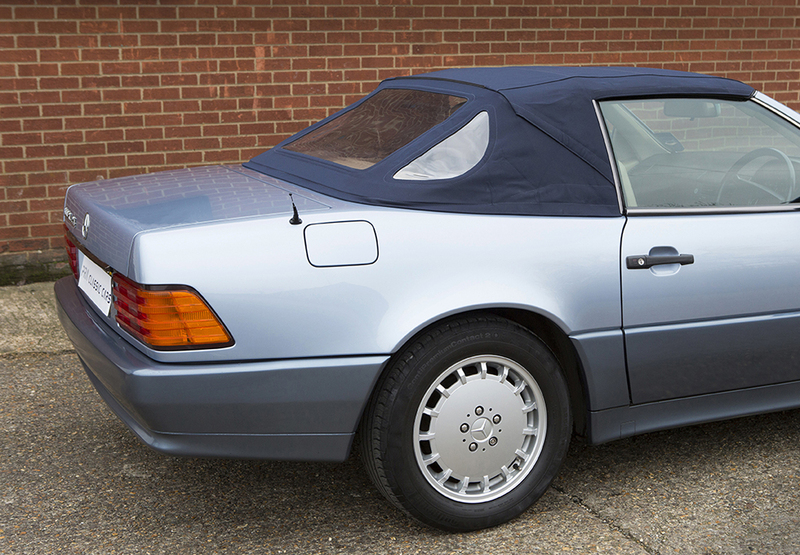 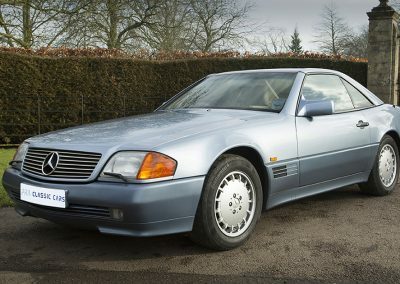 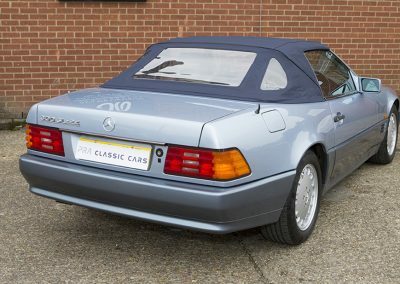 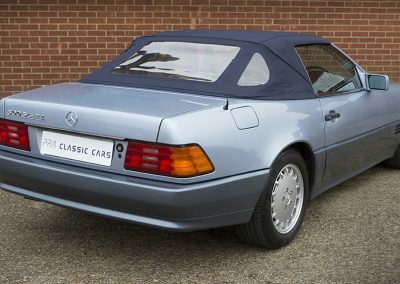 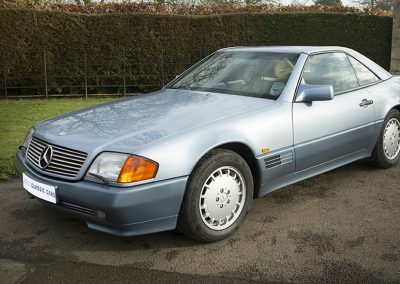 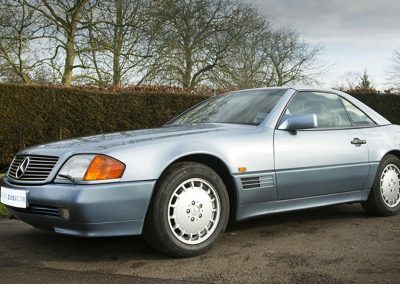 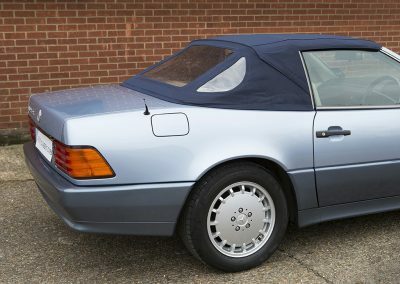 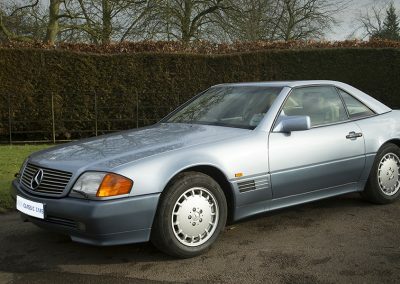 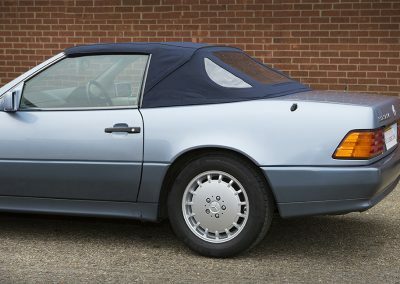 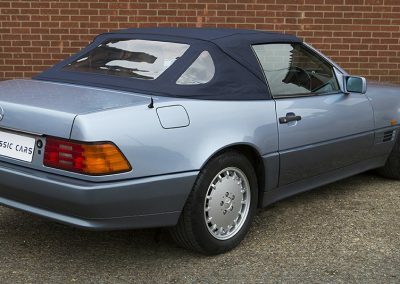 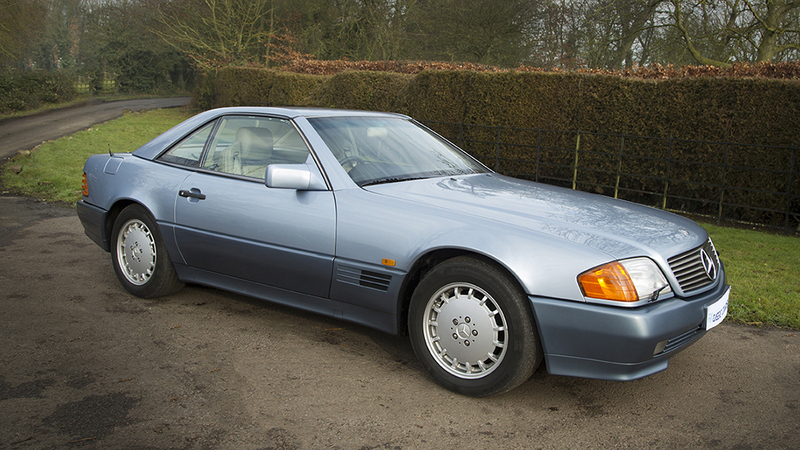 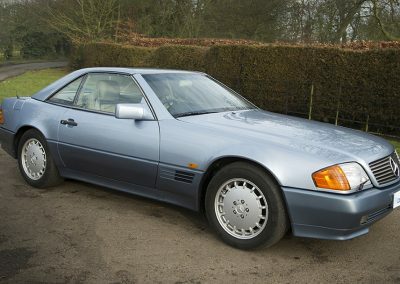 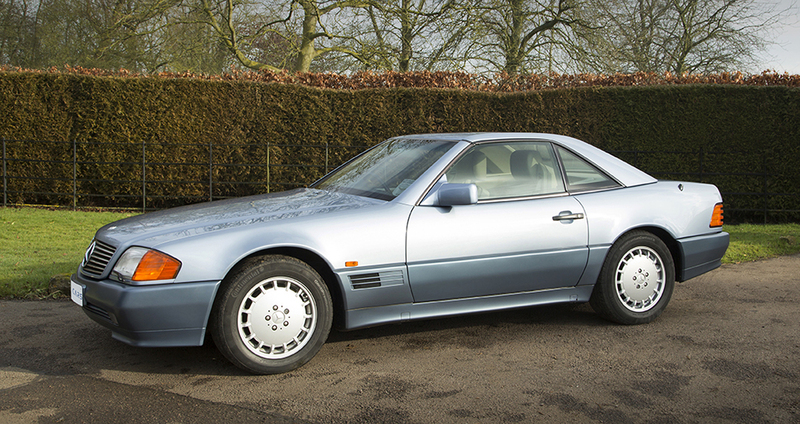 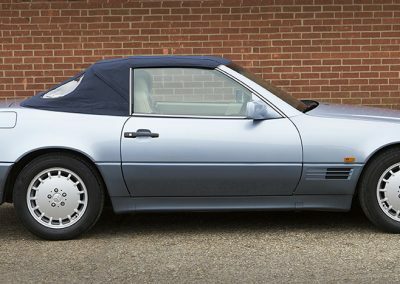 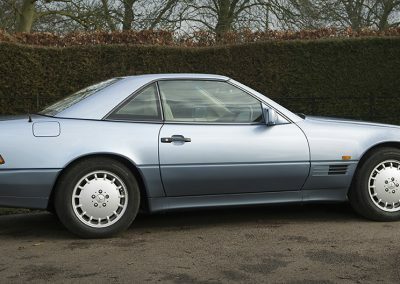 This early Mercedes SL is in “show” condition, a credit to its former owner. 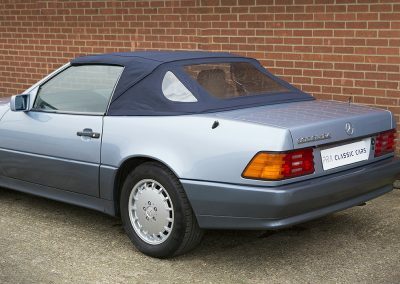 Resplendent in what is in my opinion the best colour combination of pearl blue metallic with mushroom leather upholstery and a navy fabric roof. 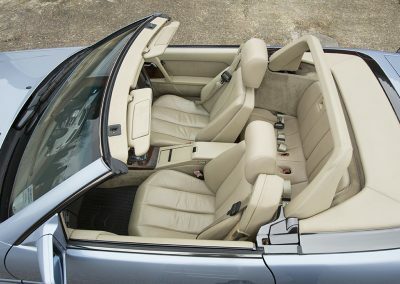 The car has all of the desirable factory options and cost the first owner in excess of £65000 when delivered new. 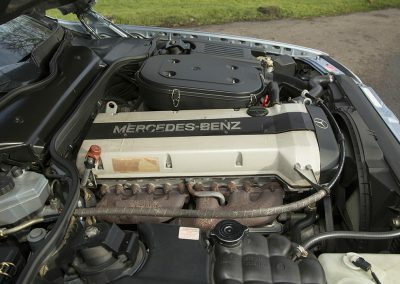 There is a huge history file with dozens of old invoices and MOTs plus all of the original books in their black wallet. 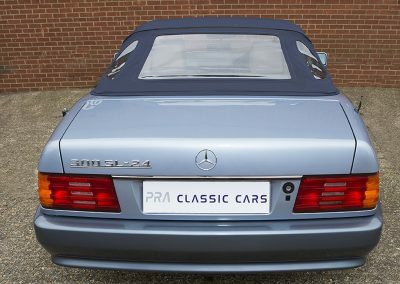 She comes with a full service history showing 22 service stamps which up to 64600 miles were all at the supplying dealer, Hughes of Beaconsfield. 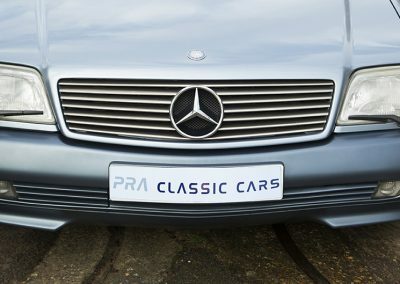 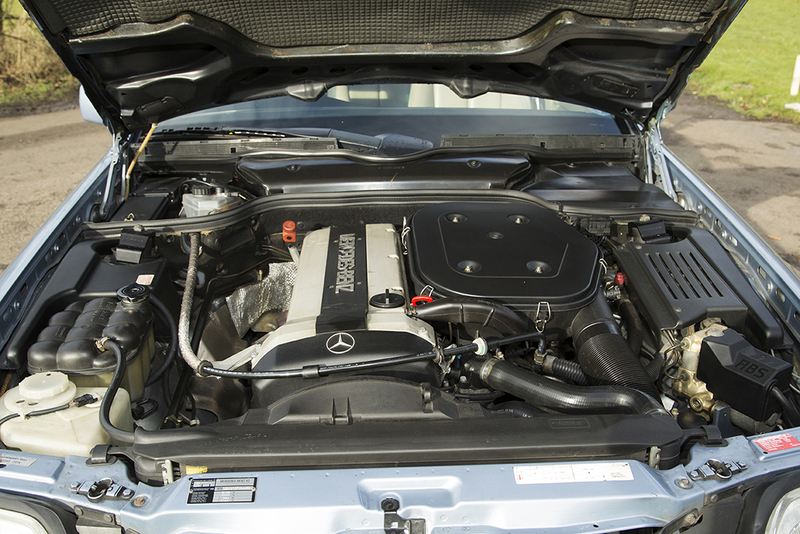 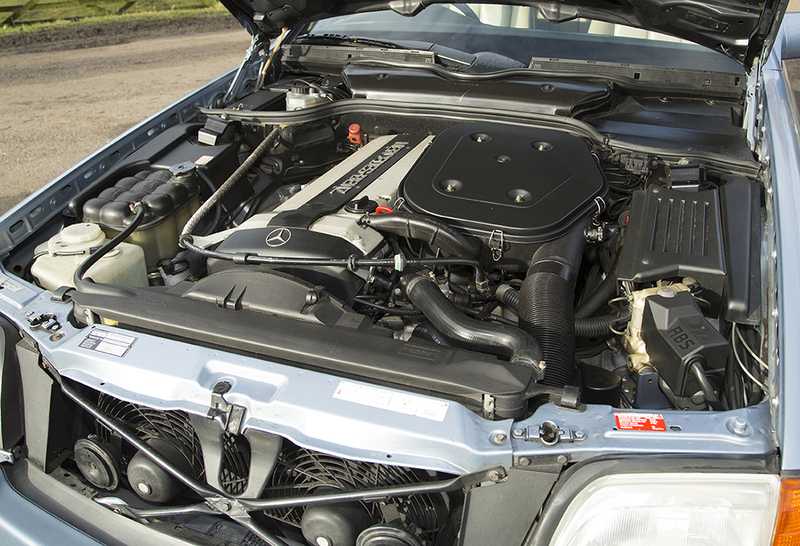 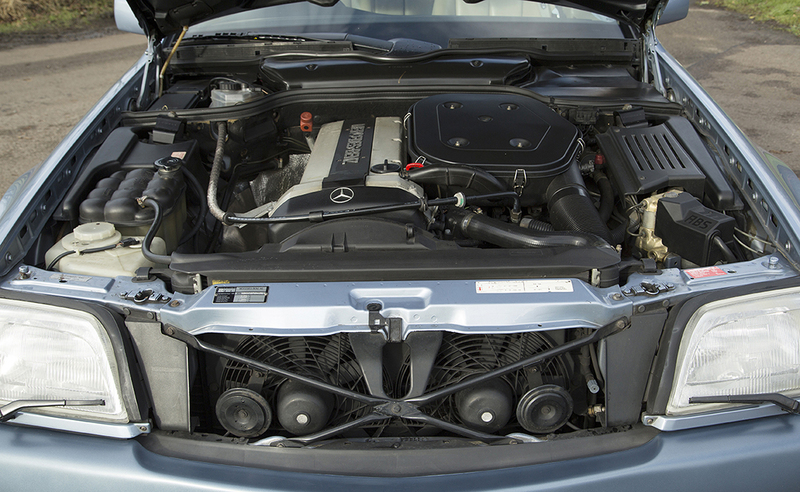 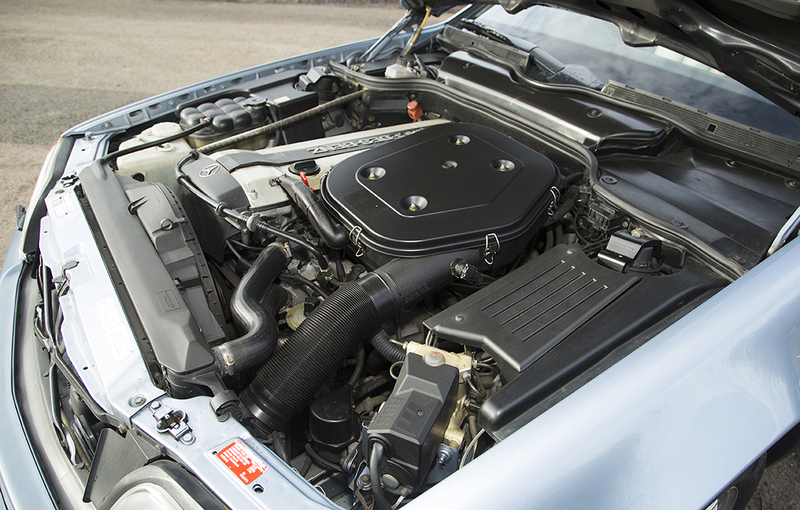 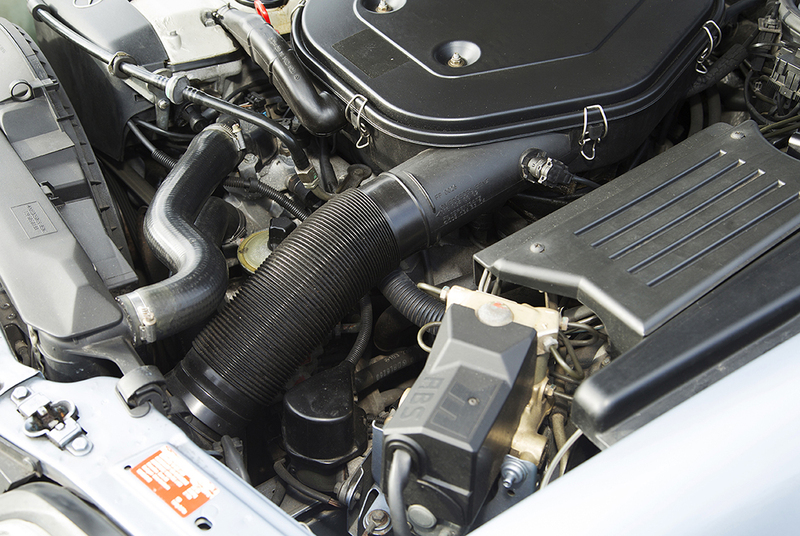 Thereafter all of the remaining services have been carried out by Hughes of Poole the respected Mercedes specialists. 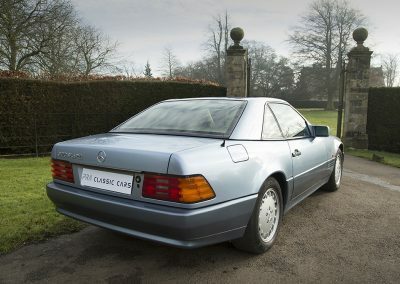 I believe the car to be in outstanding condition for the age. 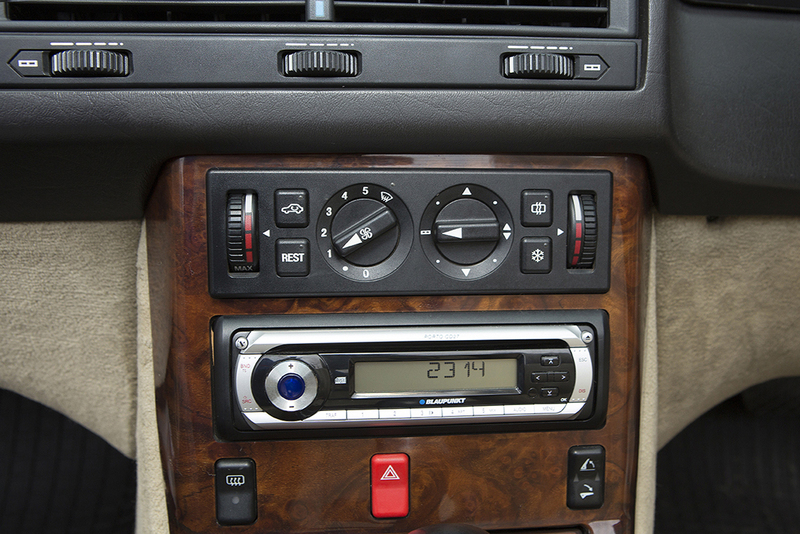 Everything works as it should, with the last service carried out at only 2000 miles ago and an MOT until Nov 2017. 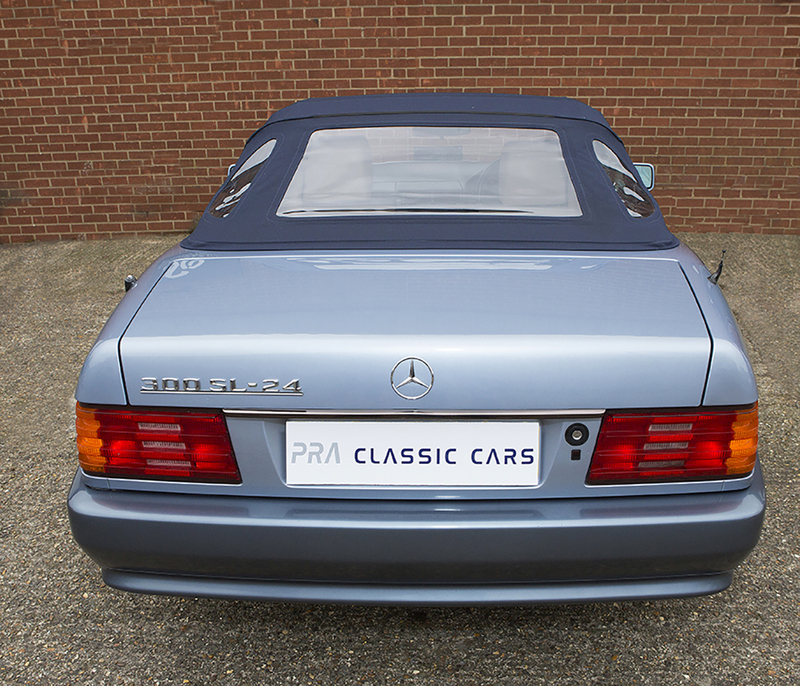 Supplied to the first owner on 1st June 1991 by Hughes of Beaconsfield. 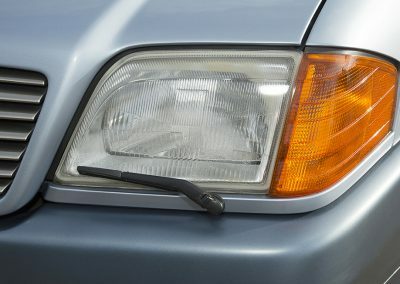 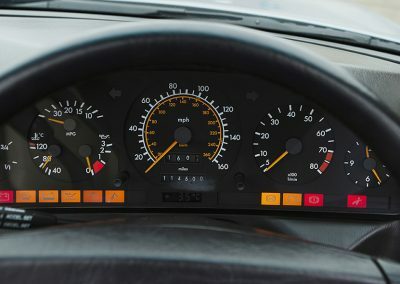 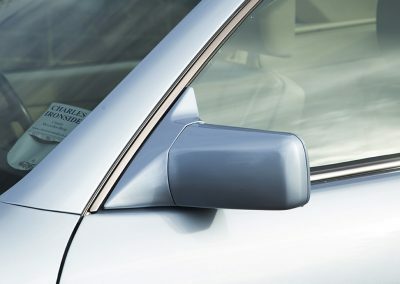 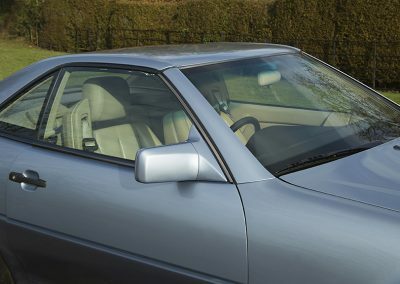 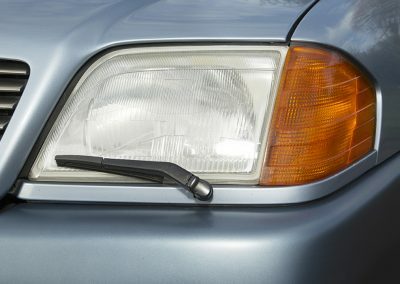 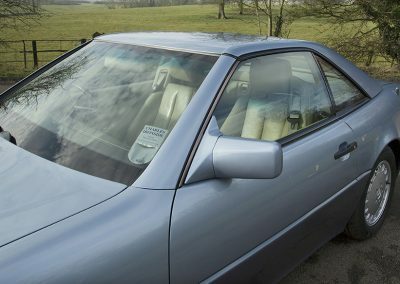 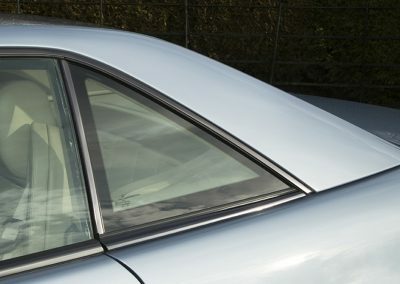 With 4 previous owners (2 were the same owner) the last of which has had the car for nearly 15 years and has lavished large sums of money maintaining the car to a very high standard. 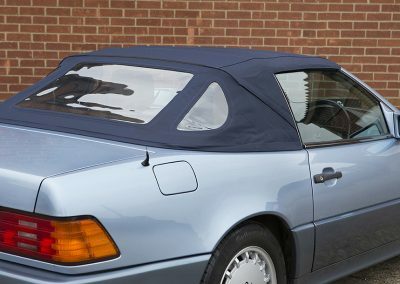 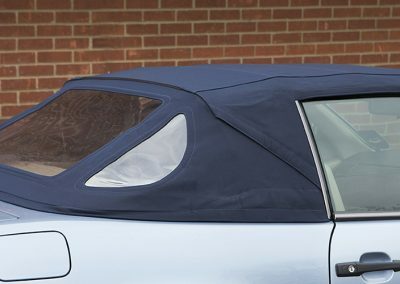 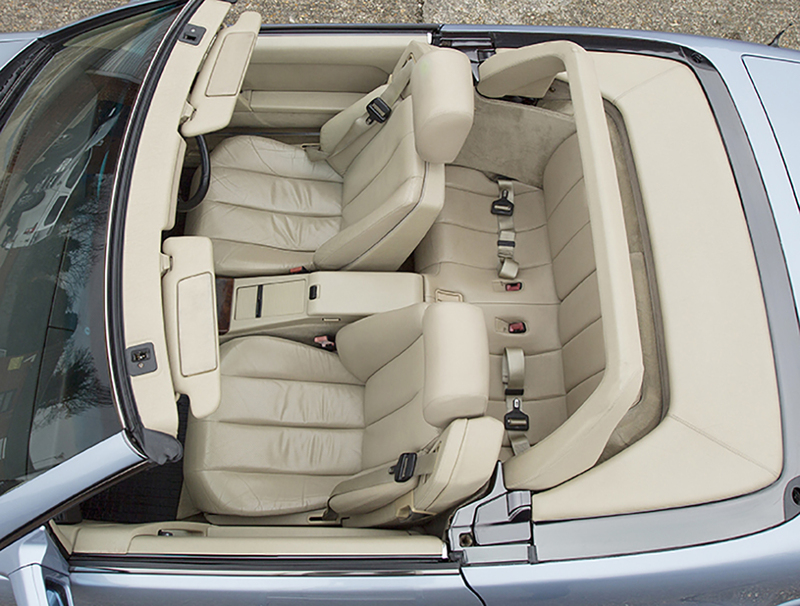 A new soft top was fitted in June 15 and there are numerous invoices for past services and MOTs. 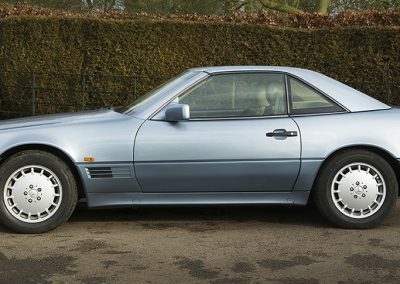 Current MOT until November 2017 with no advisories. 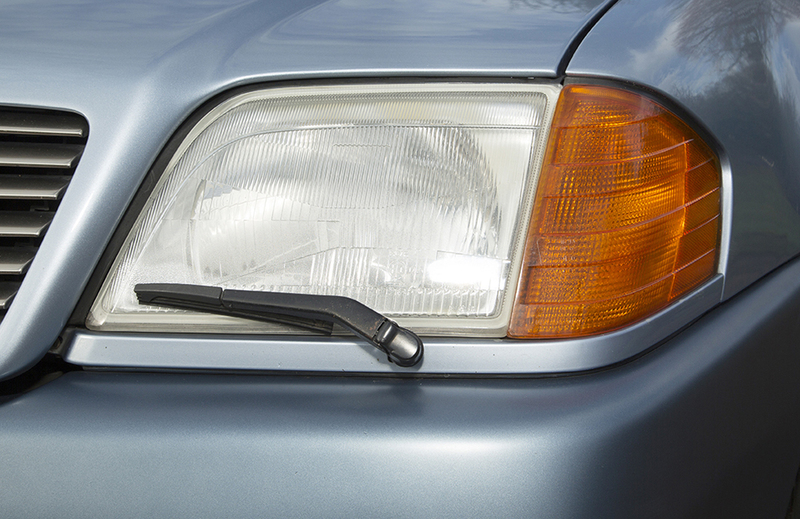 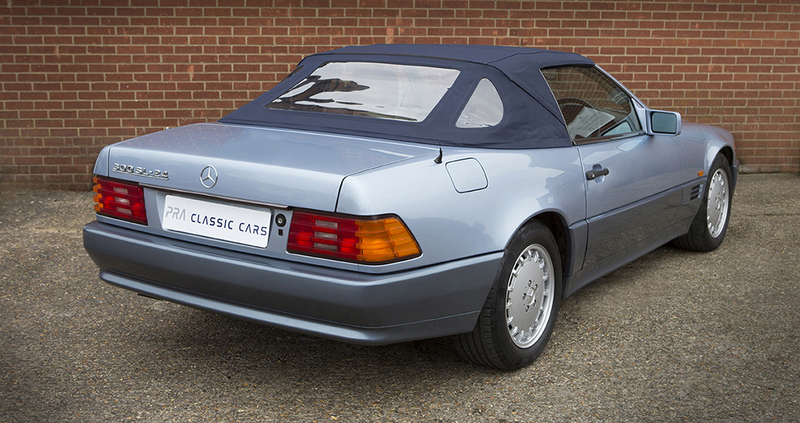 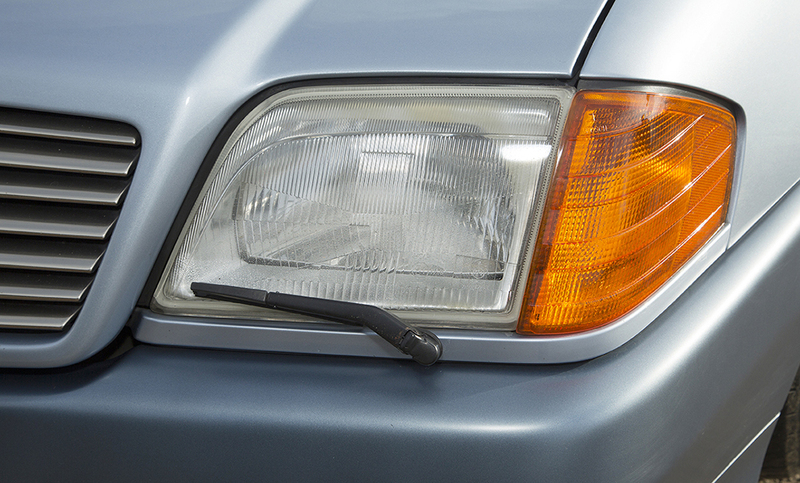 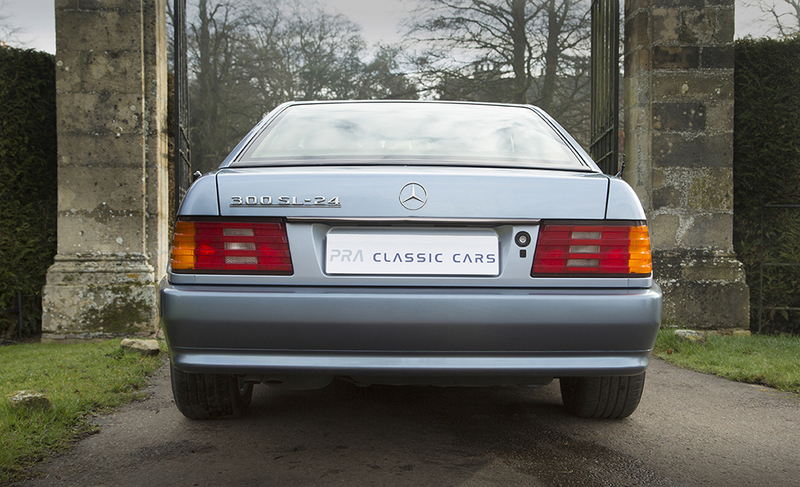 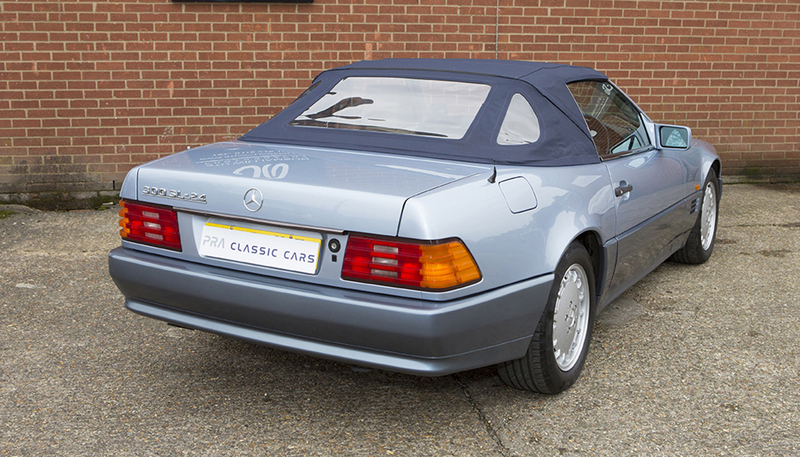 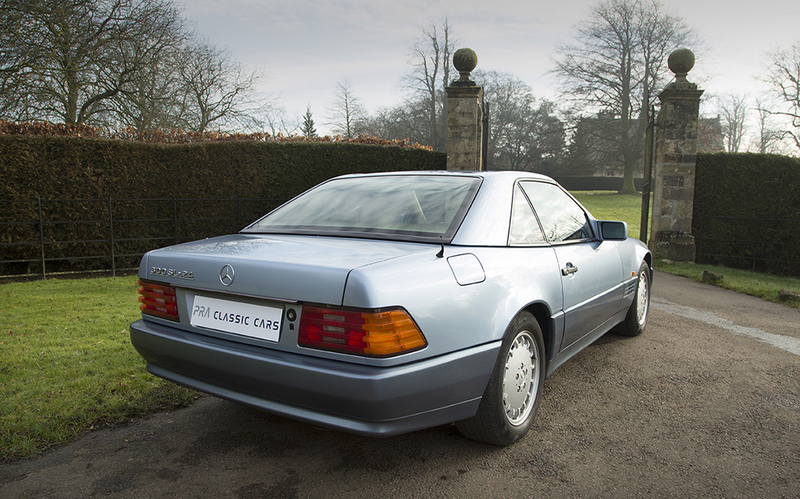 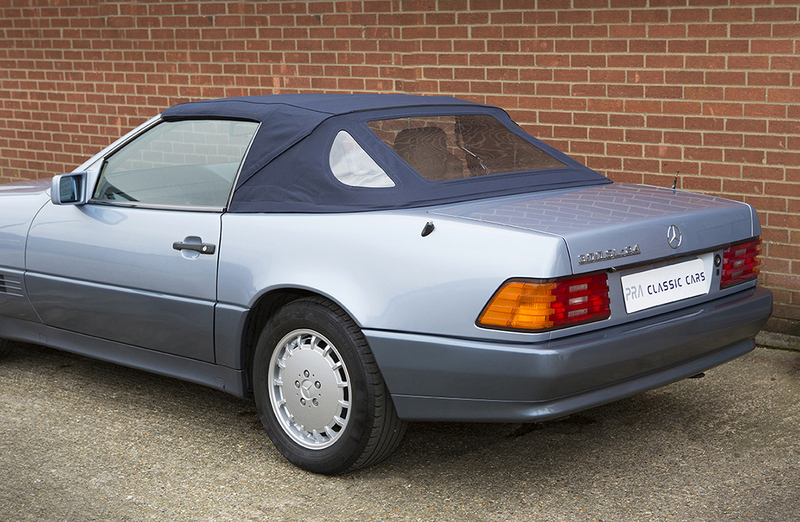 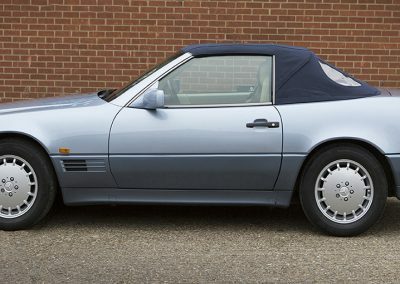 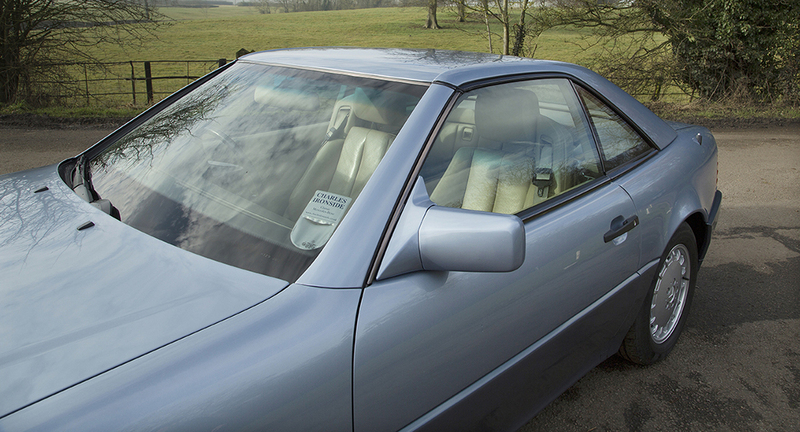 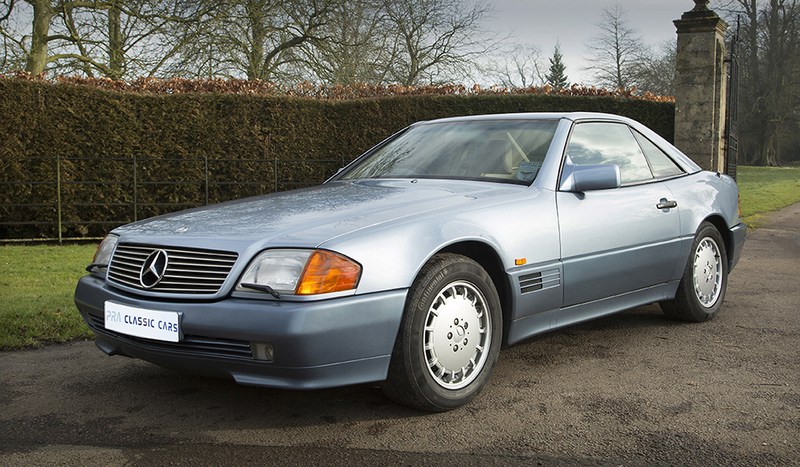 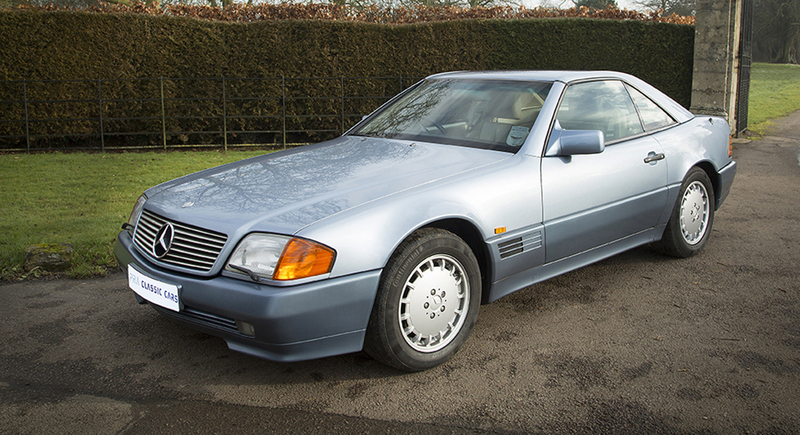 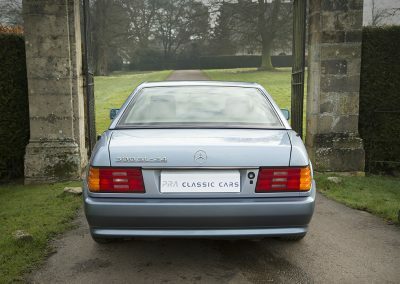 The pearl blue paintwork looks stunning belying the cars age of 26 years. 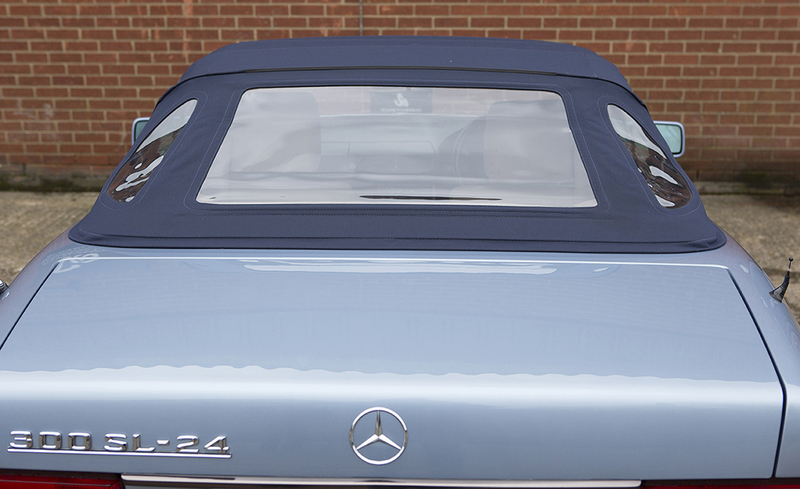 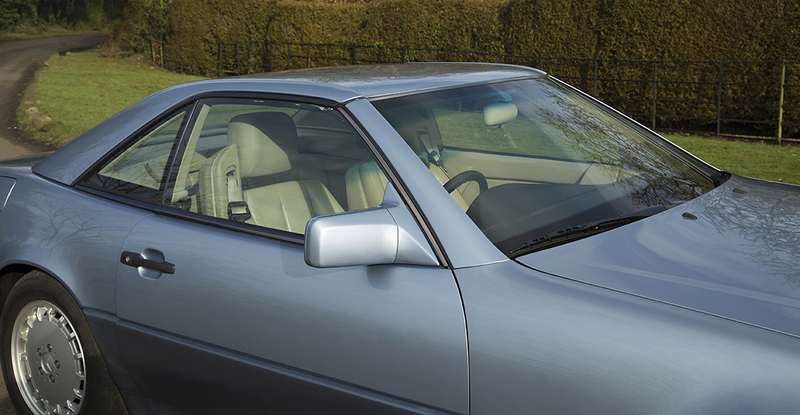 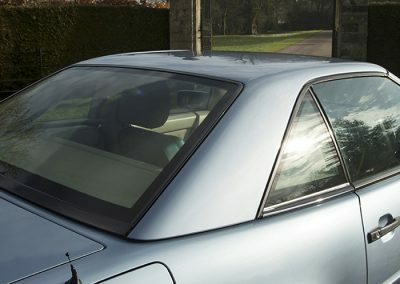 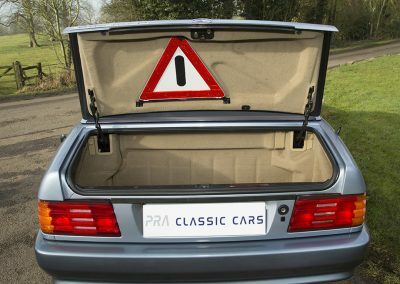 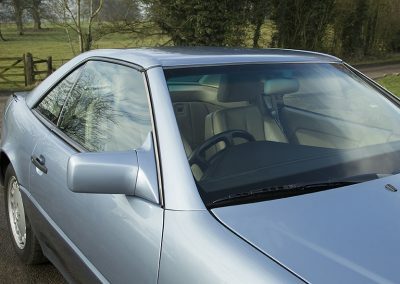 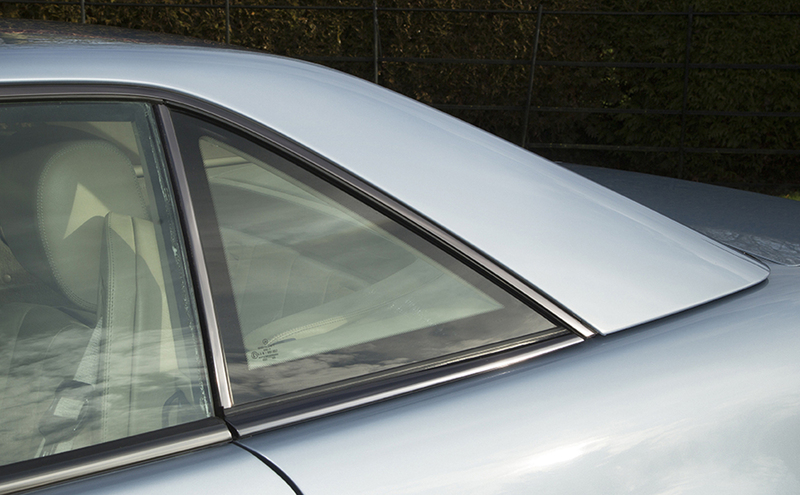 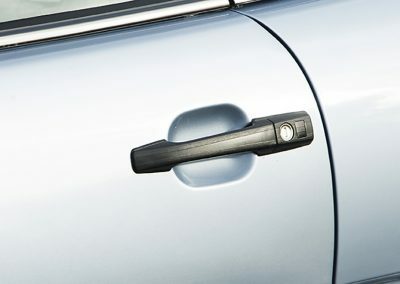 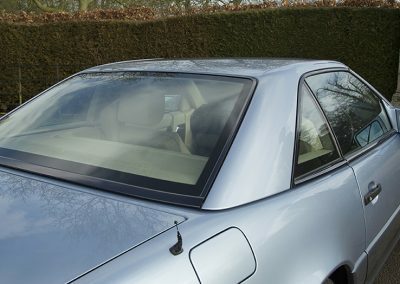 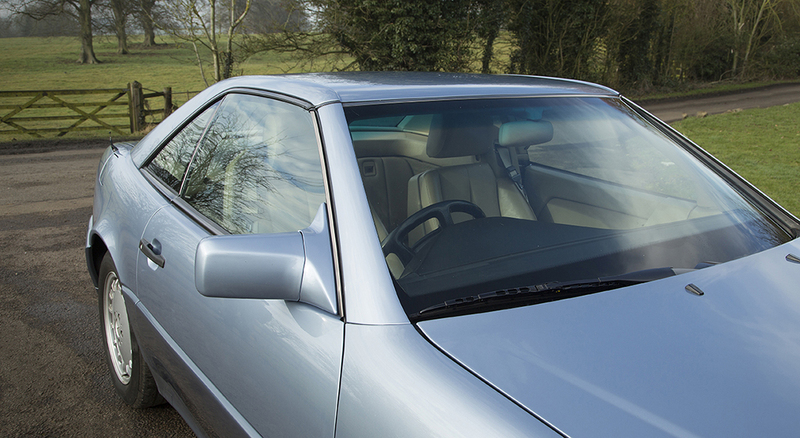 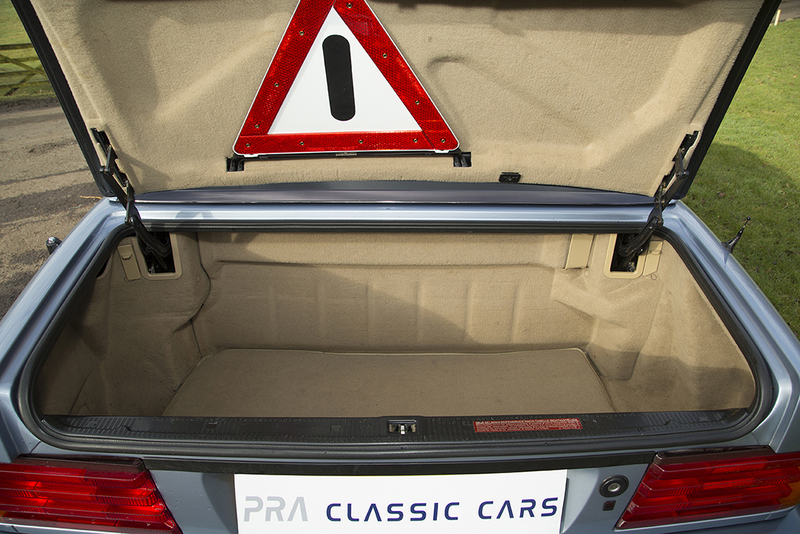 The aluminium hard top is as new and the doors have no dents or ripples on them. 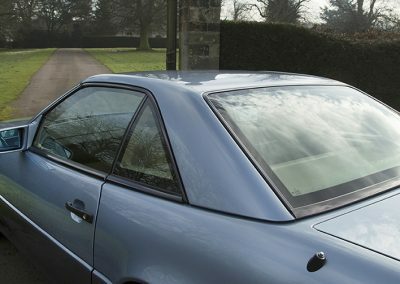 If I am being very picky there a couple of very small stone chips on the bonnet and down the edge of the driver’s door there is a very small mark which is hardly noticeable. 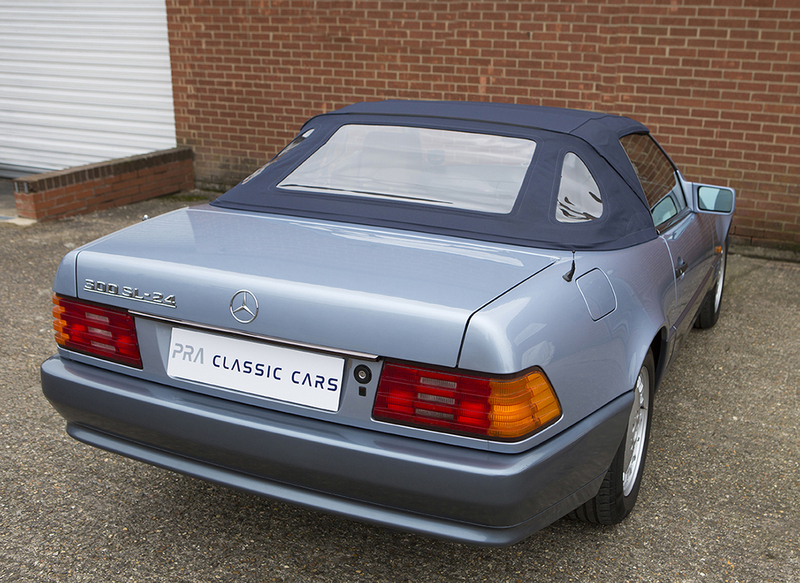 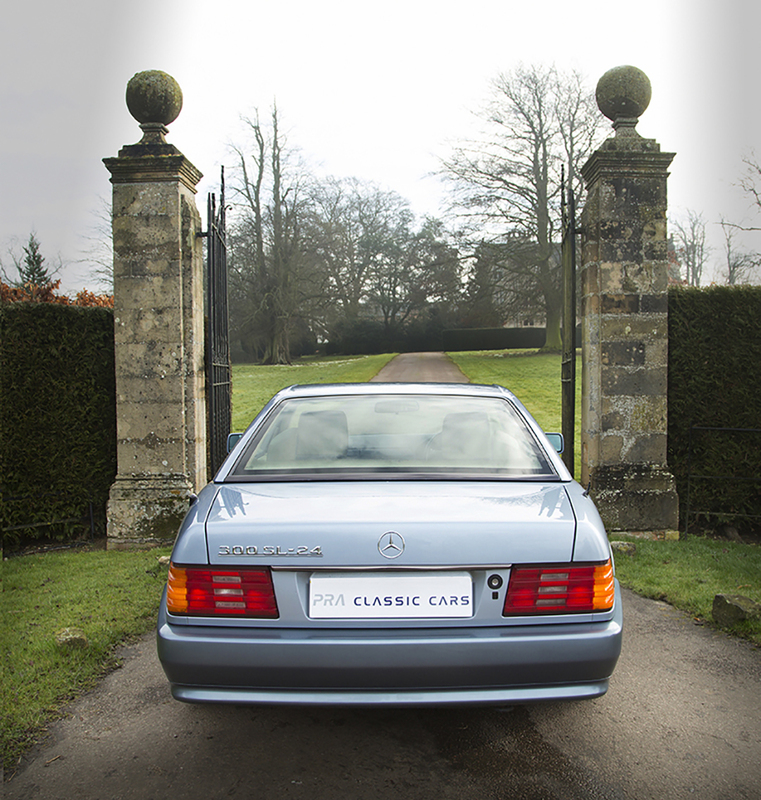 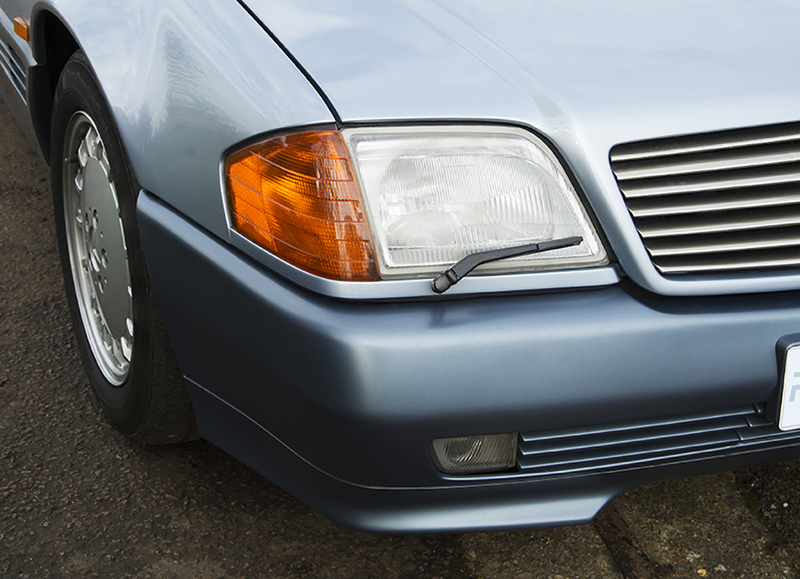 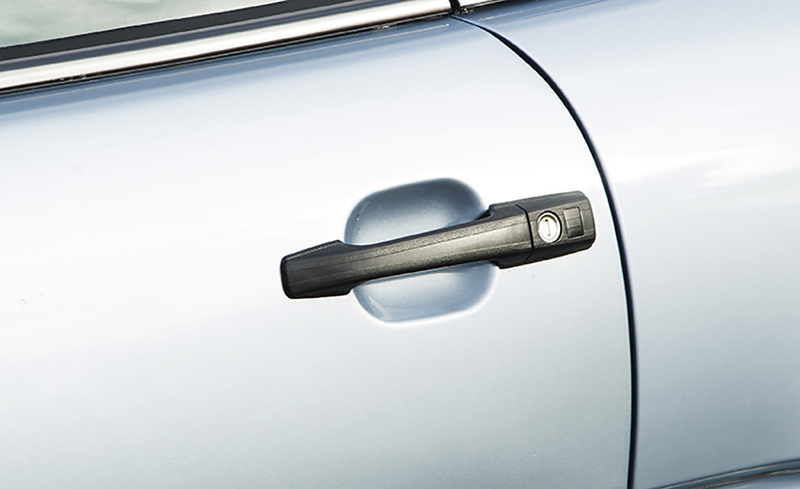 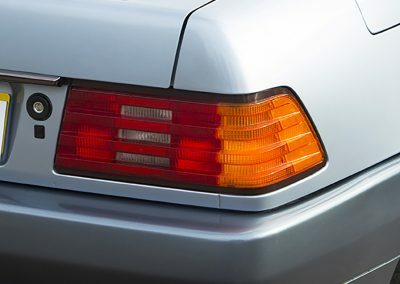 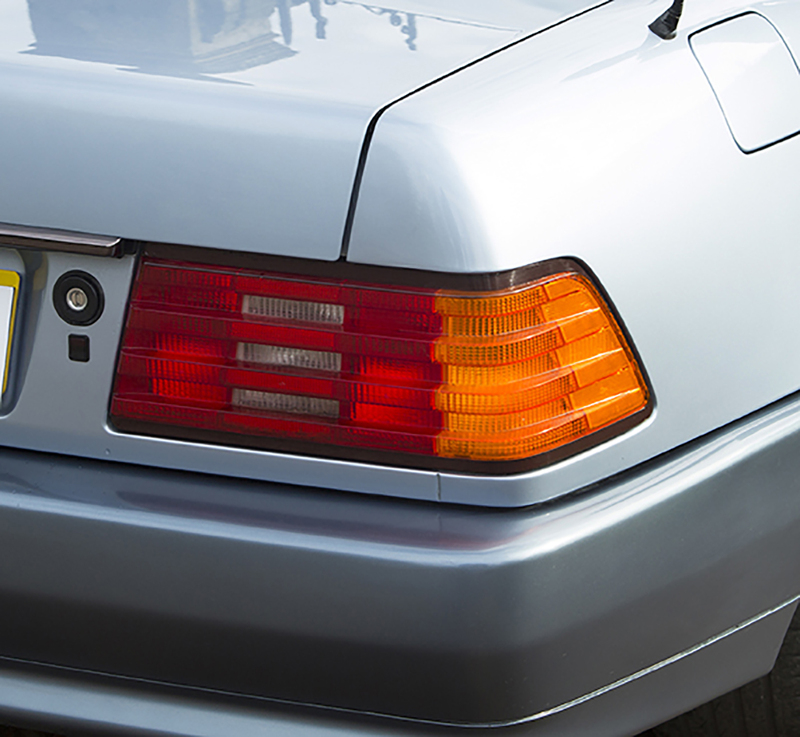 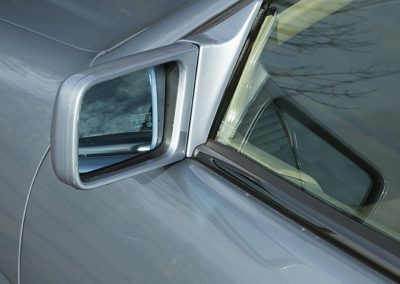 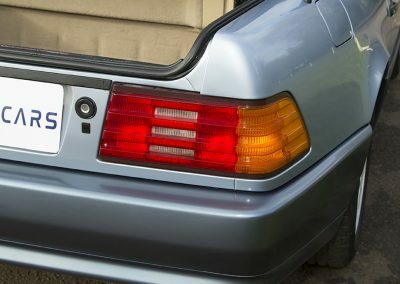 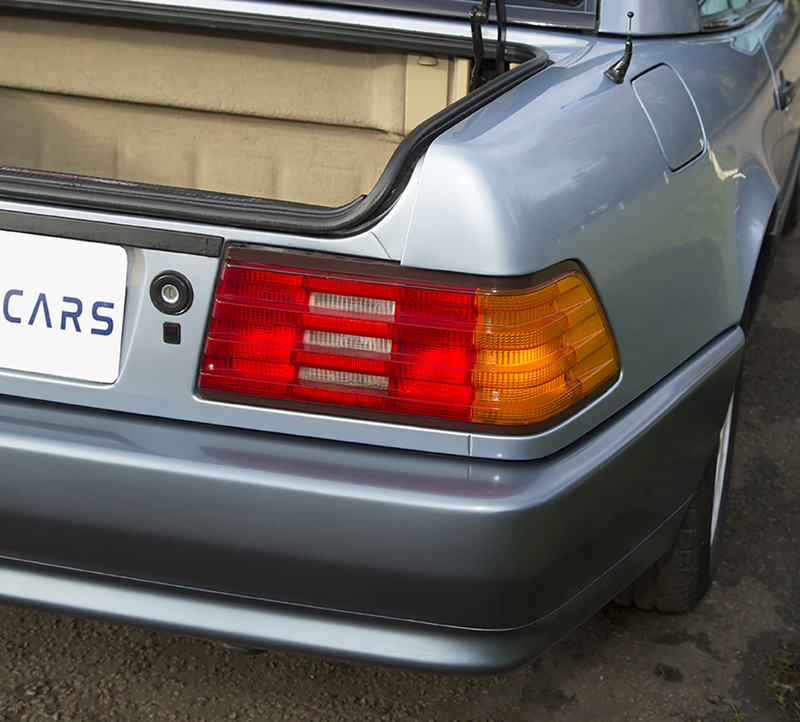 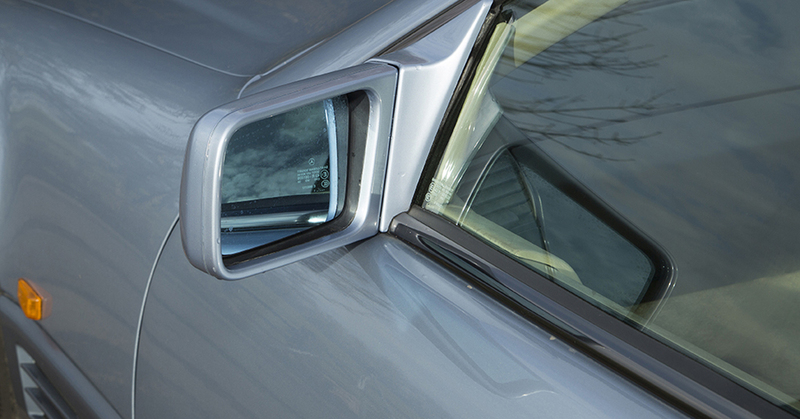 The bumpers and lower body cladding are in exceptional condition, having been professionally re sprayed in the past. 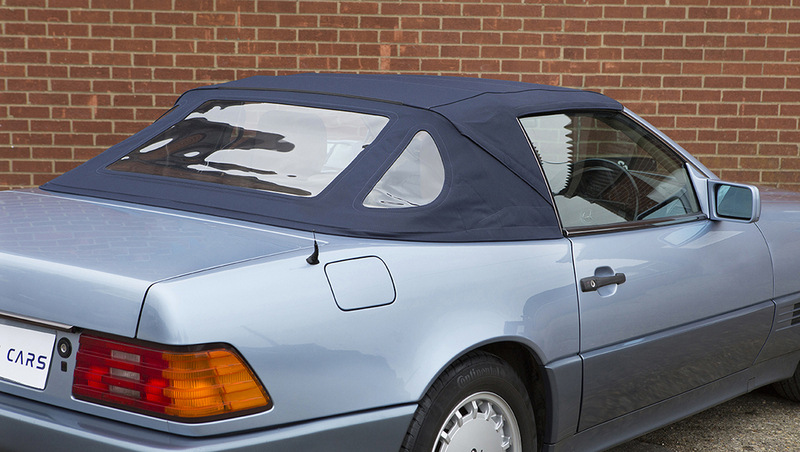 At about the same time a new navy fabric roof was fitted at considerable cost. 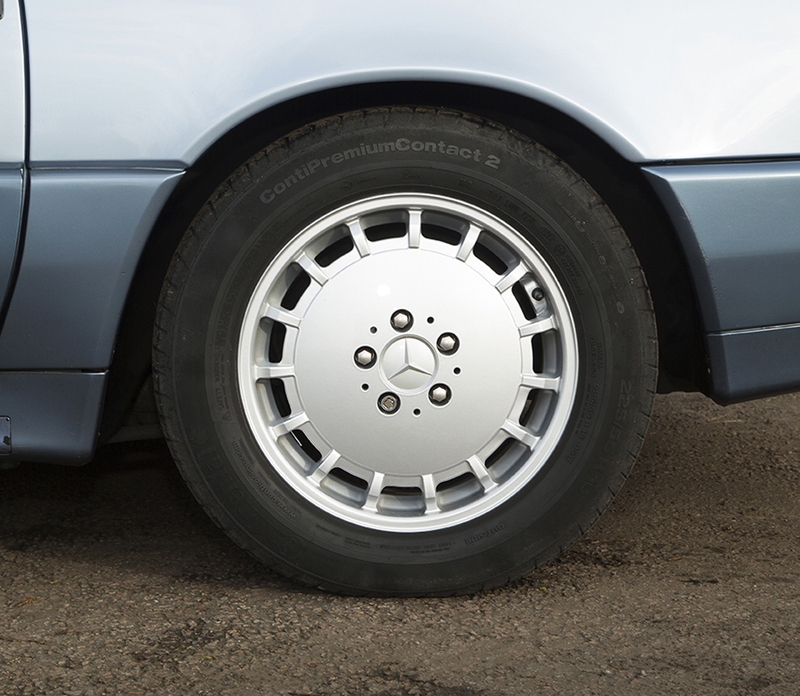 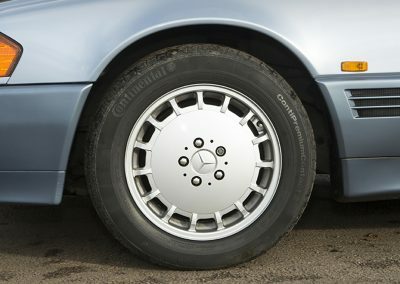 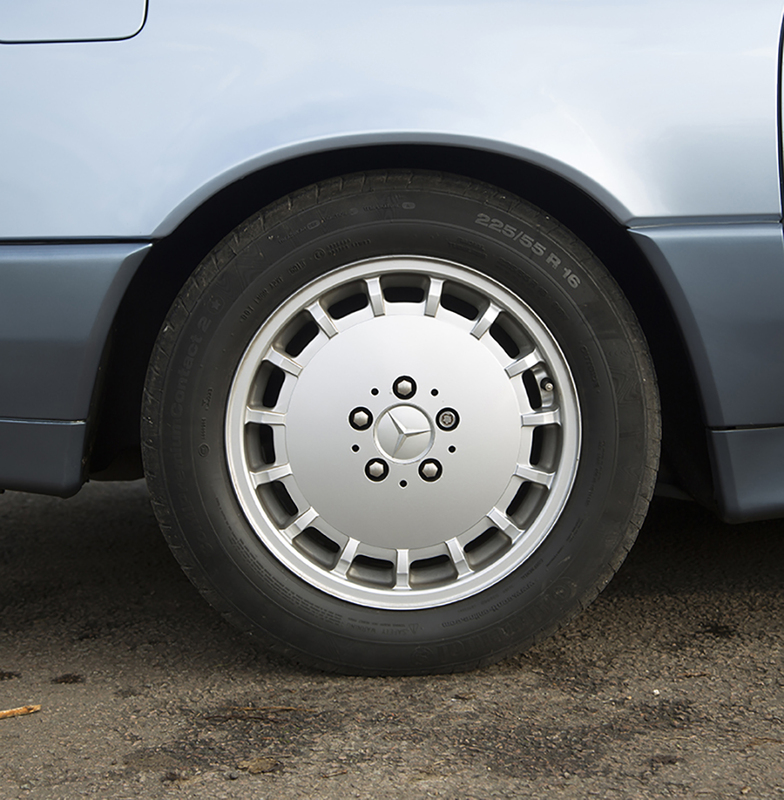 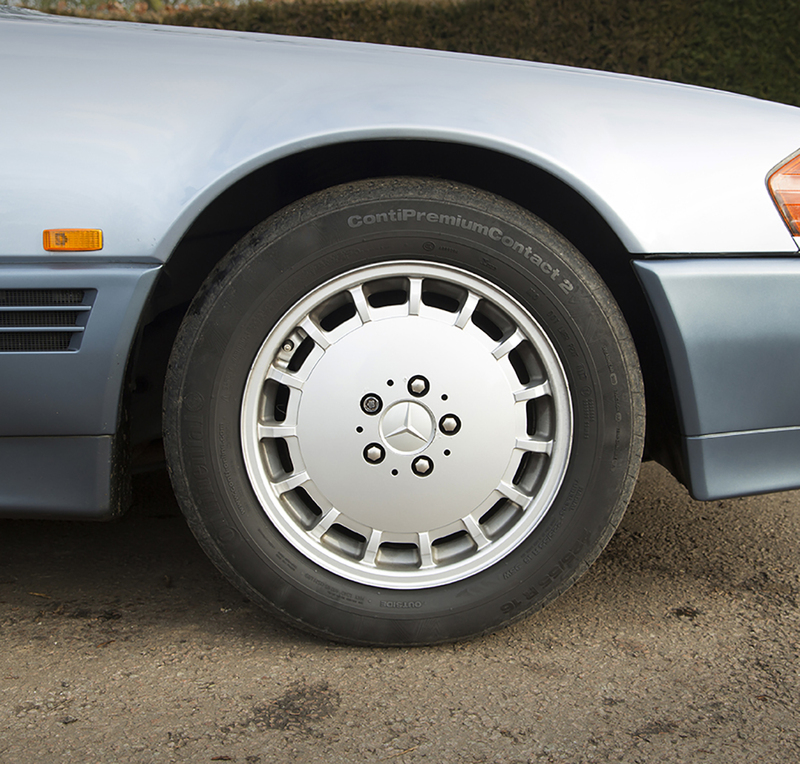 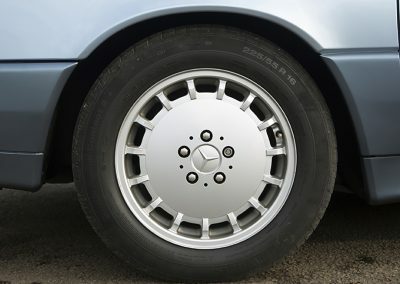 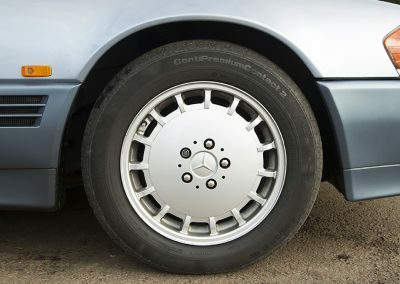 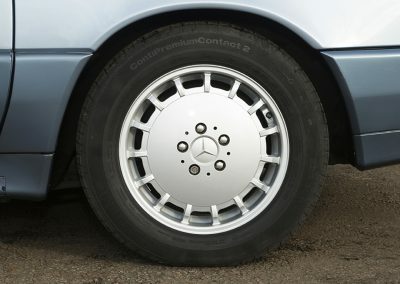 The 16” alloy wheels are in excellent order and have been refurbished at some point. 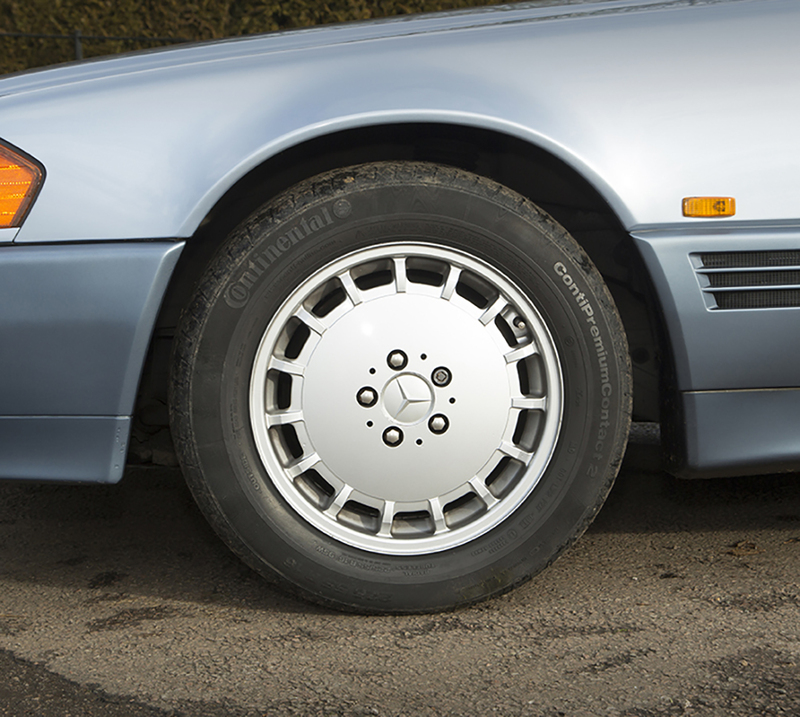 Matching Continental contact 2 tyres adorn the wheels with ample tread remaining. 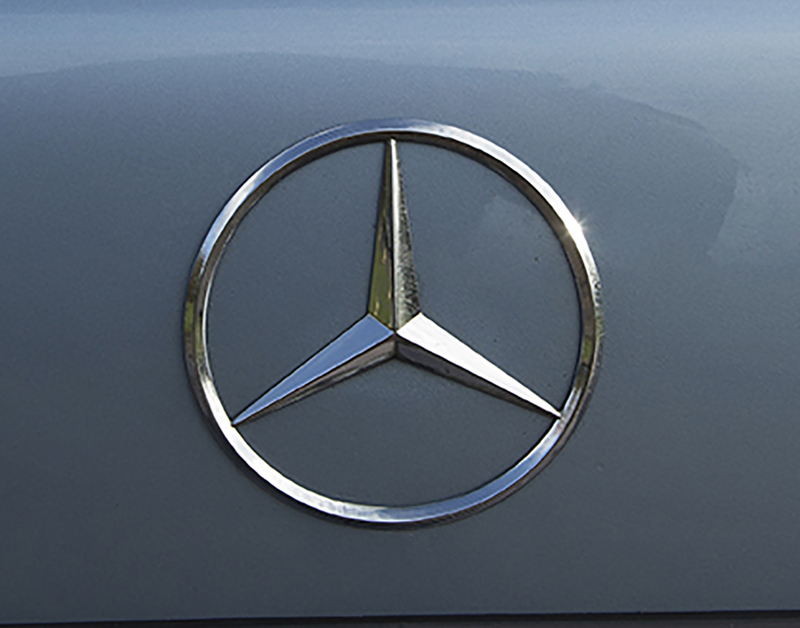 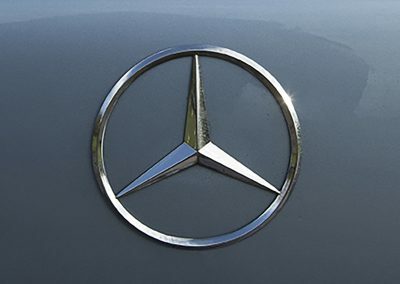 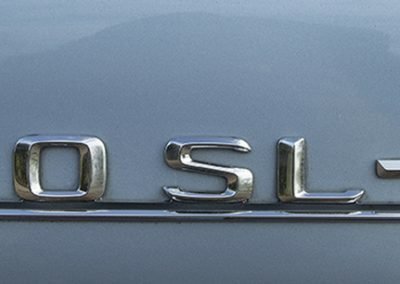 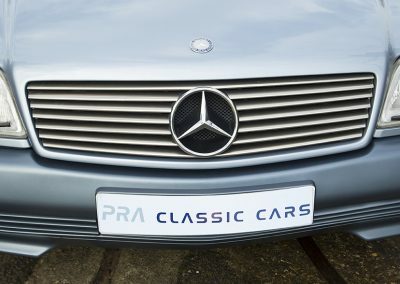 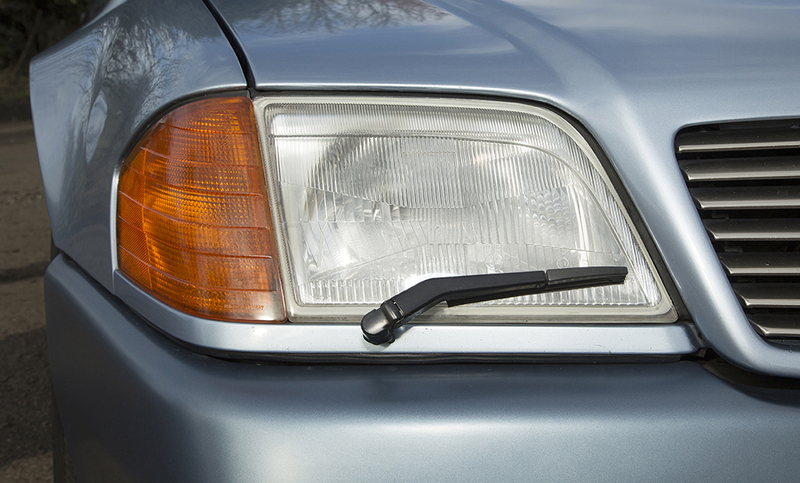 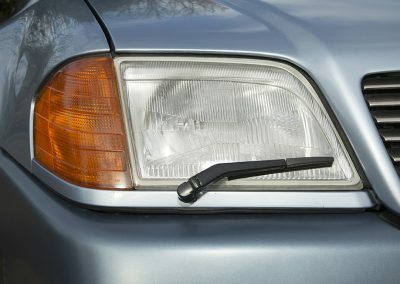 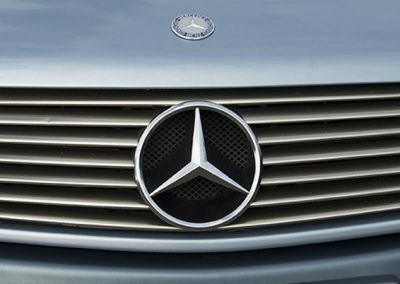 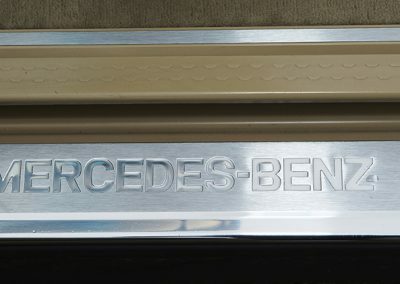 The front grille has a very small dent just to the left of the star. 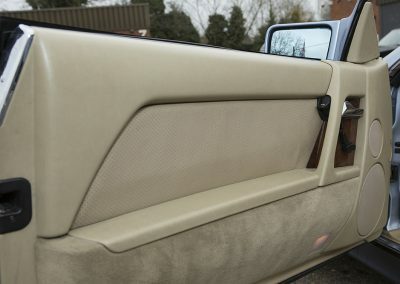 This may just be visible to you in one of the pictures but again is hardly noticeable. 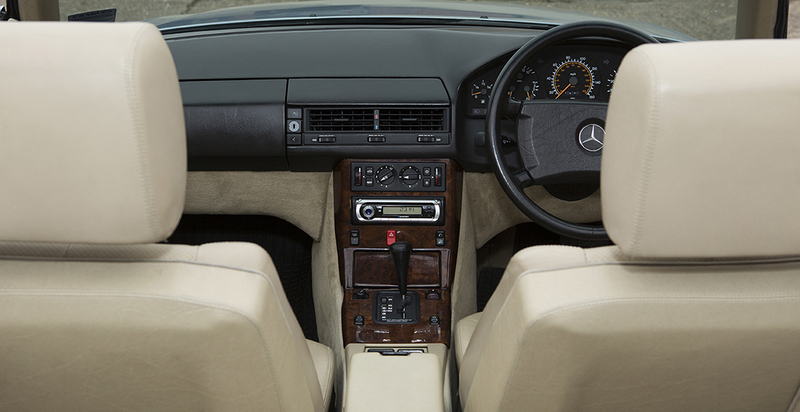 The mushroom leather upholstery and black dashboard complement each other very well. 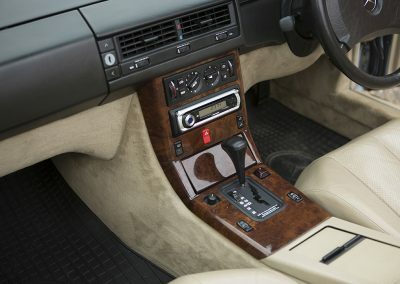 With thick pile carpets and matching over mats the inside of this car is luxurious. 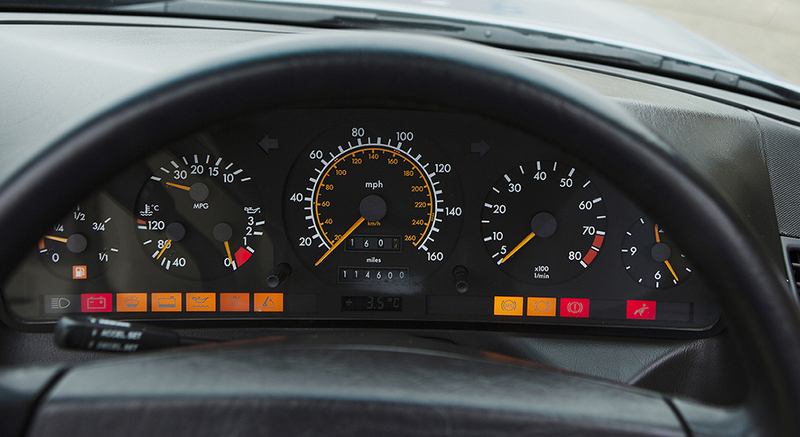 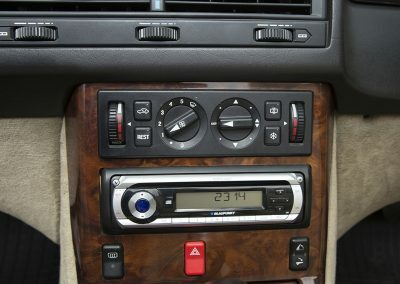 The dashboard is unmarked and the walnut inlays look perfect. 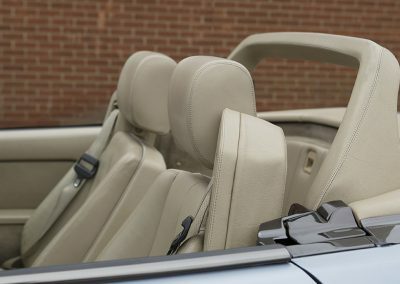 With full electric operation for both drivers and passenger seats which are supremely comfortable and even the headrests raise and lower electrically. 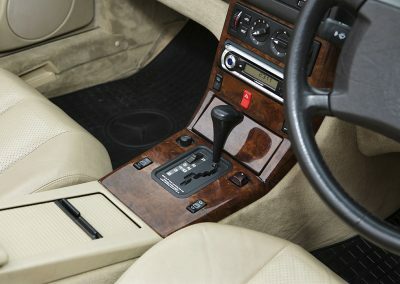 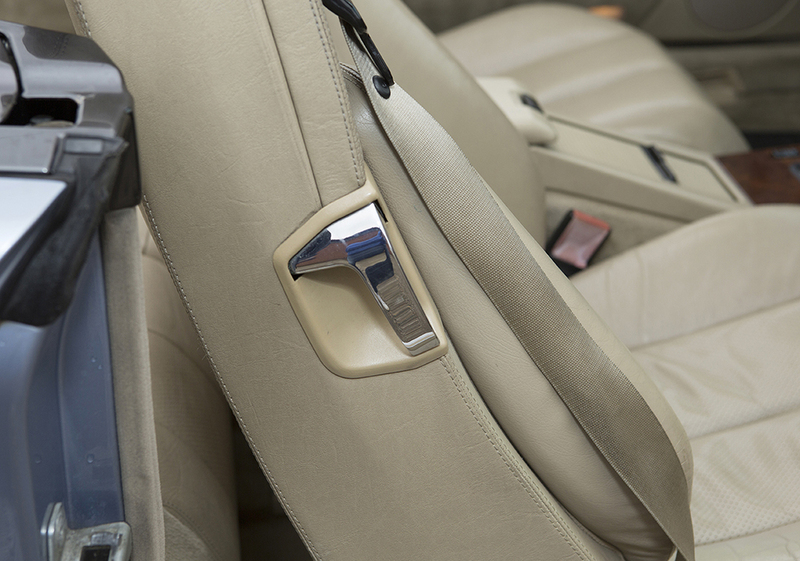 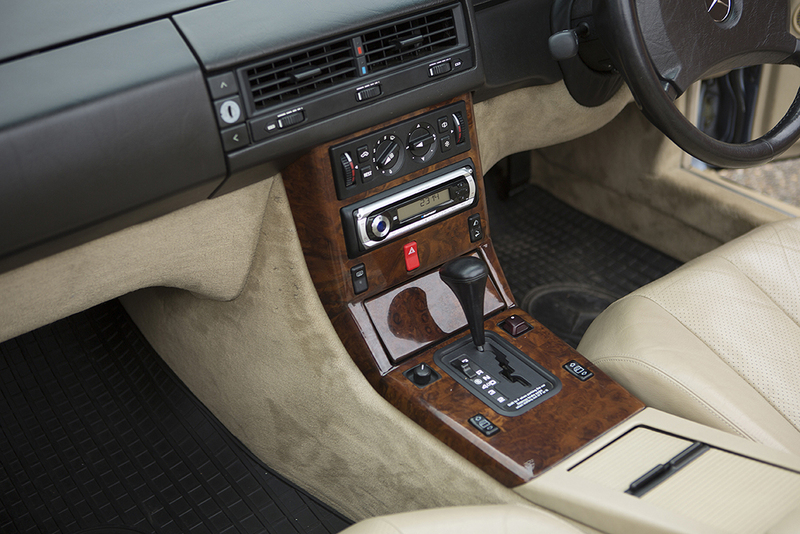 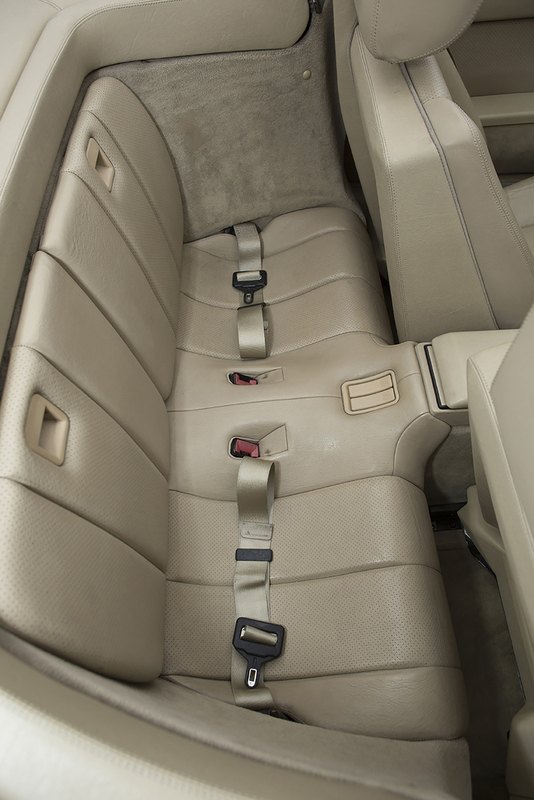 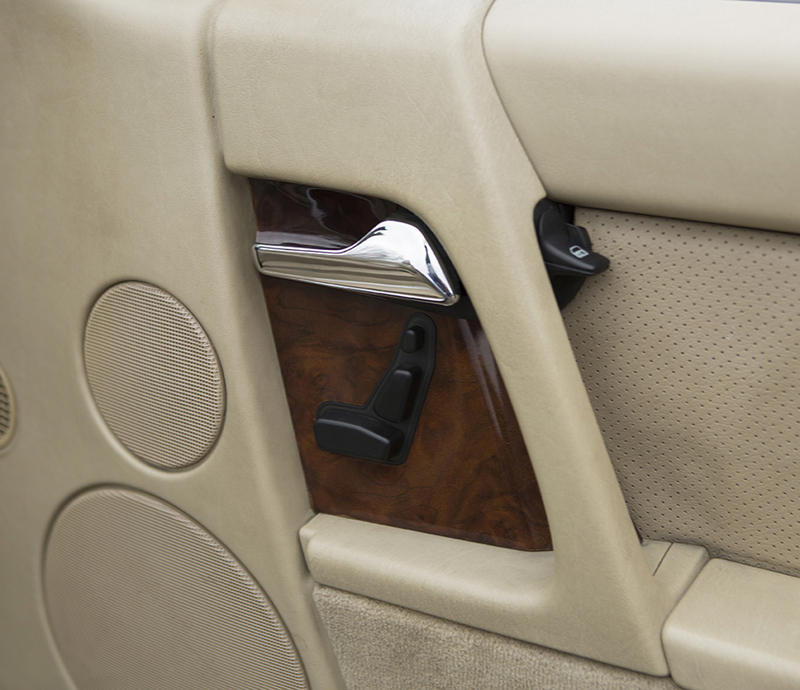 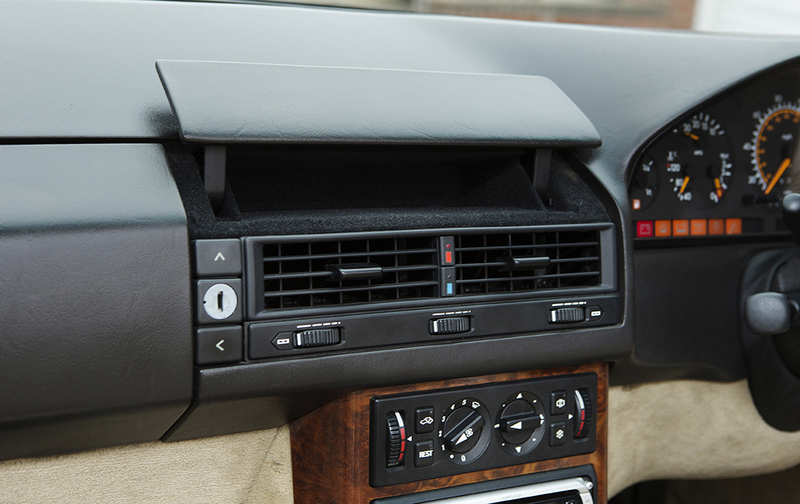 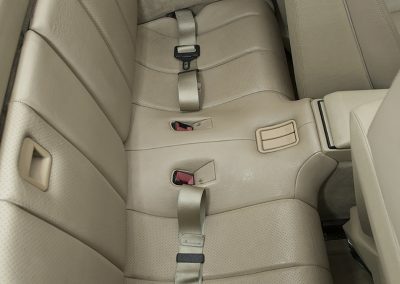 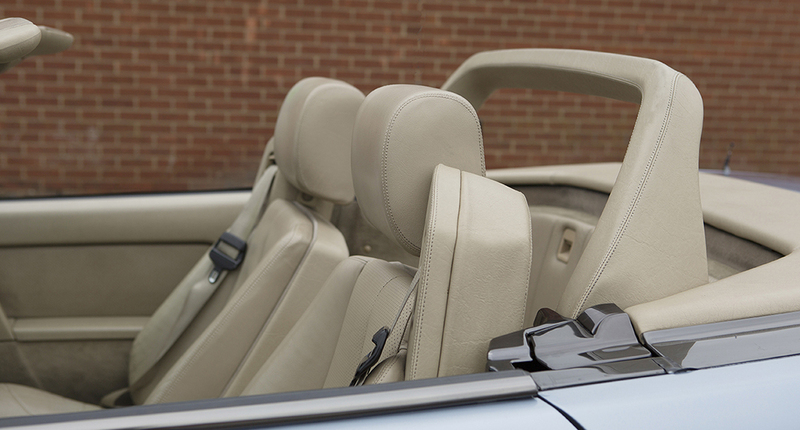 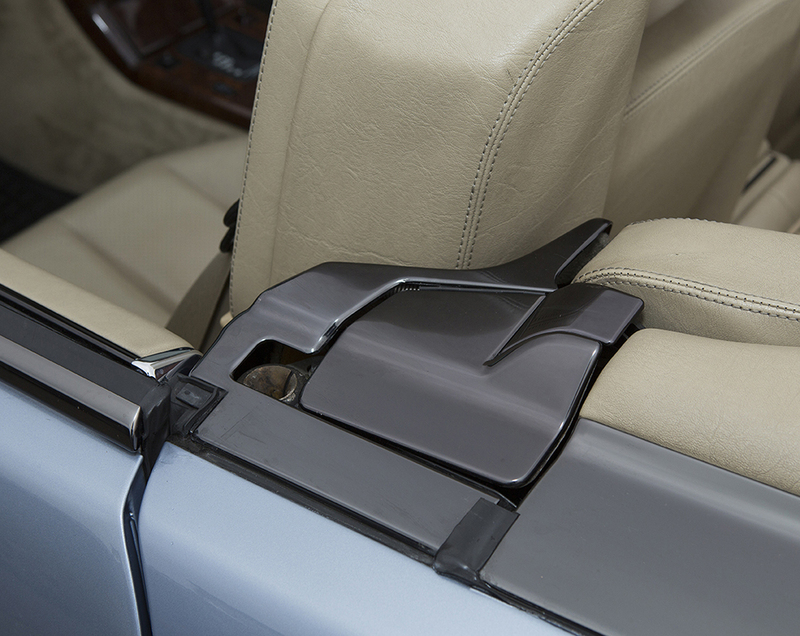 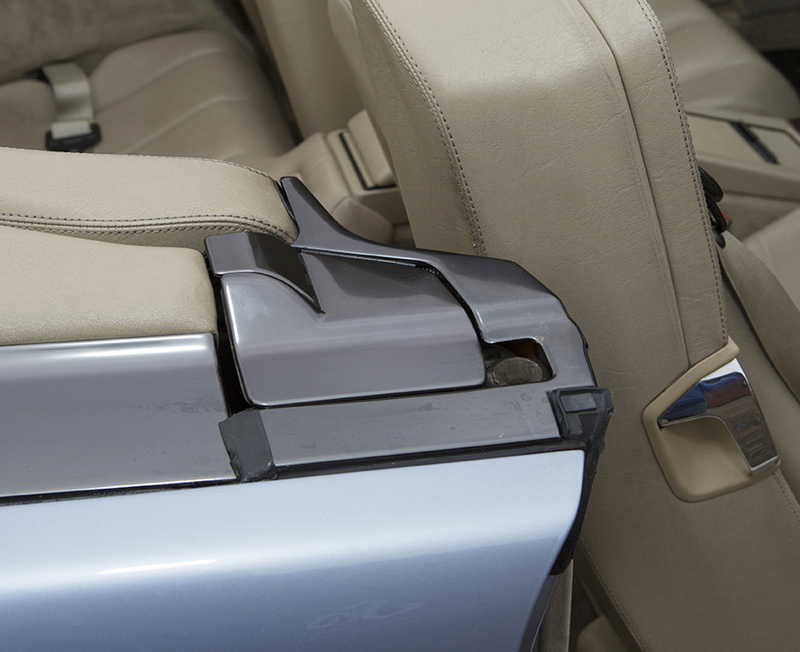 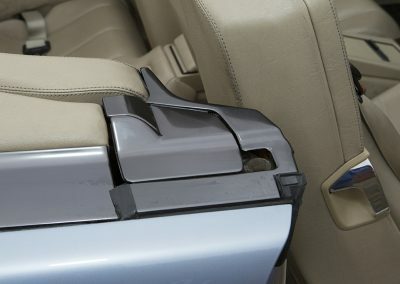 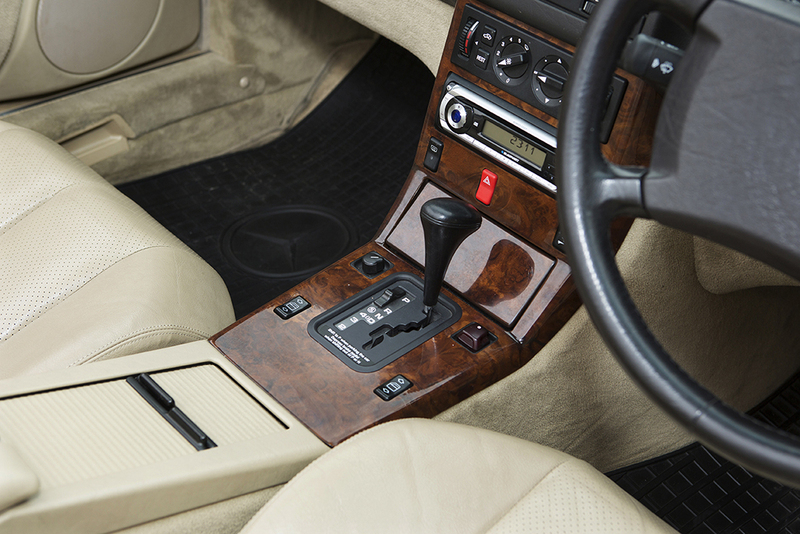 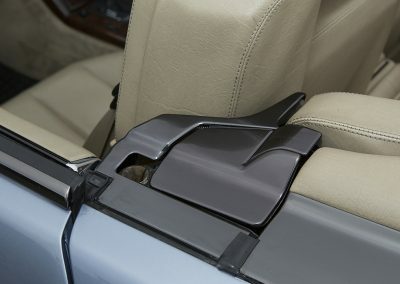 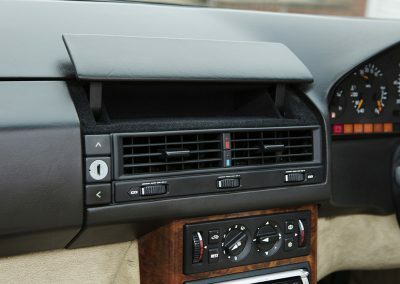 The drivers seat bolster has a small amount of wear but does not detract from the overall appearance of the interior. 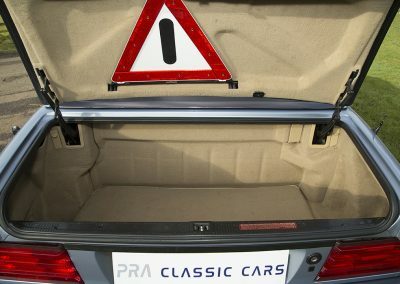 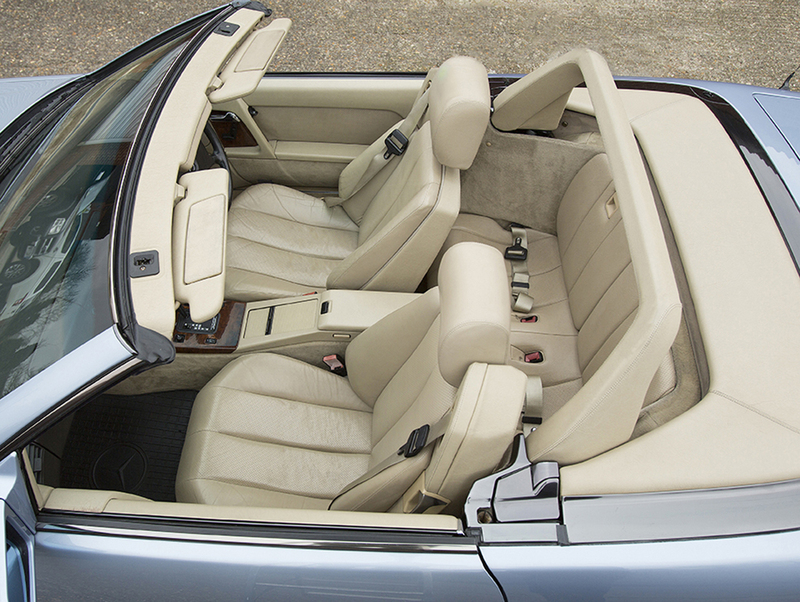 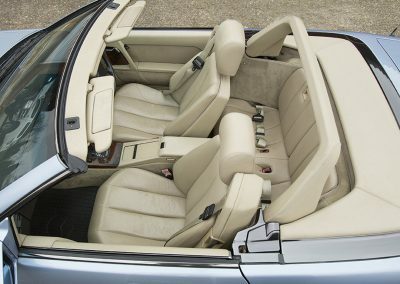 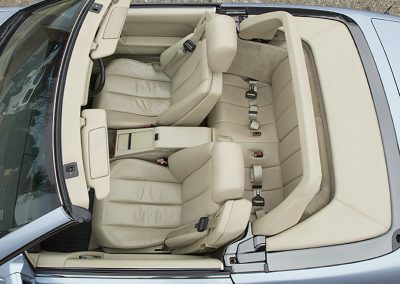 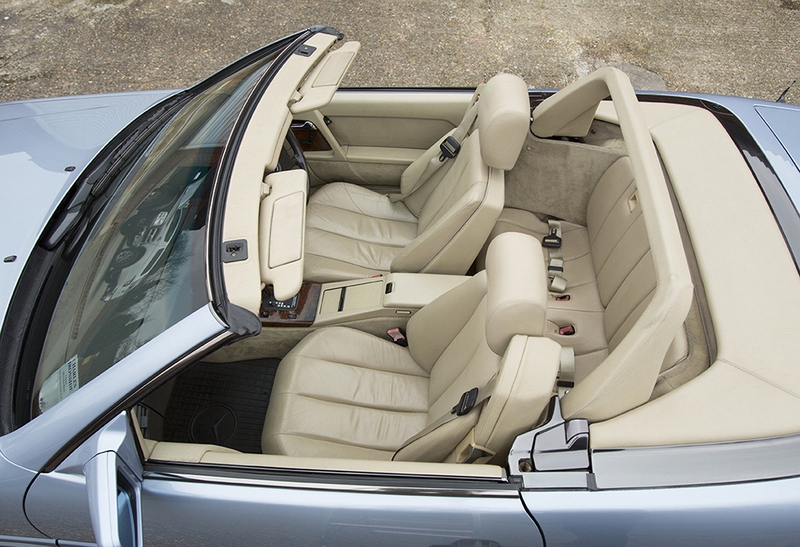 Fitted with rear seats as an option this is a practical and luxurious 2+2. 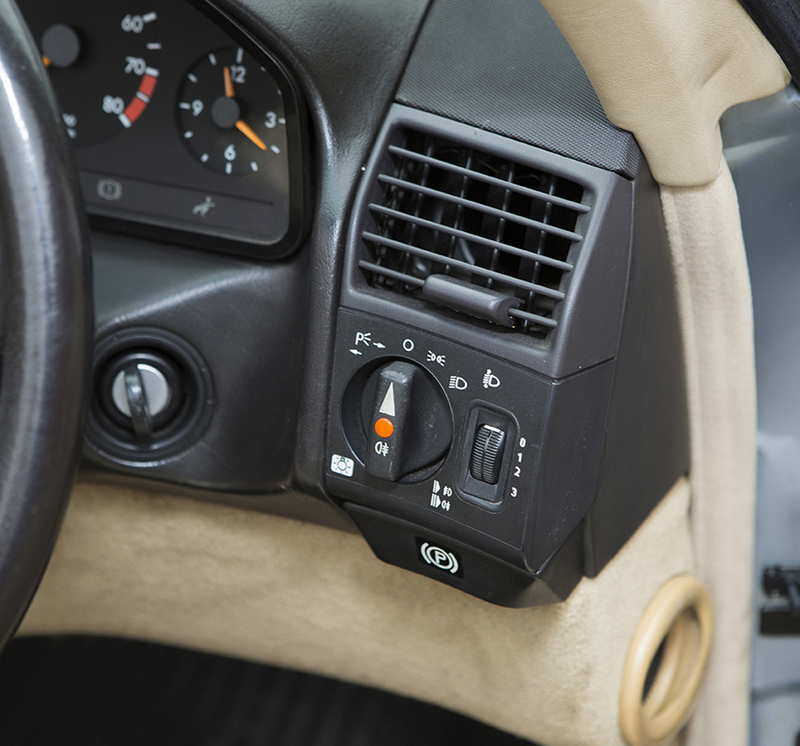 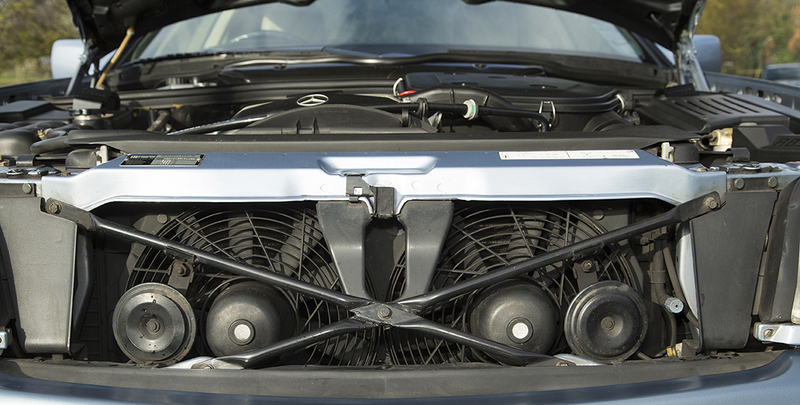 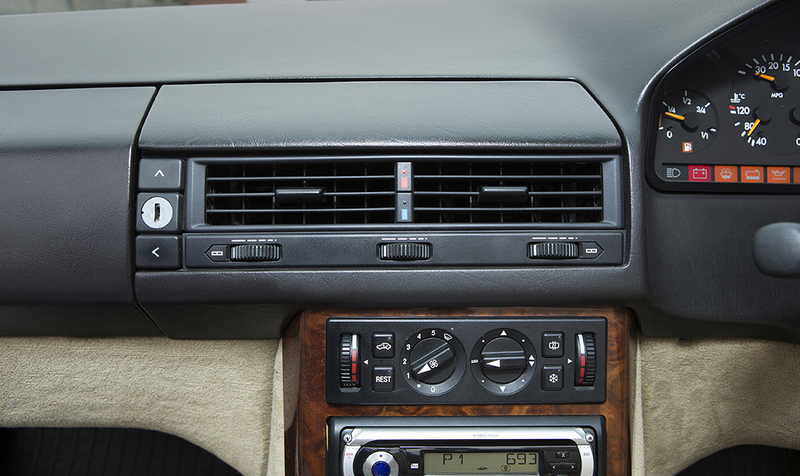 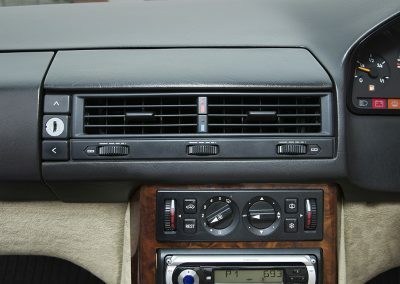 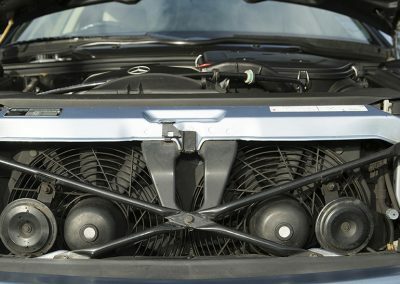 The air conditioning is fully functioning and everything on the car works as it should, just as the day the car left the factory. 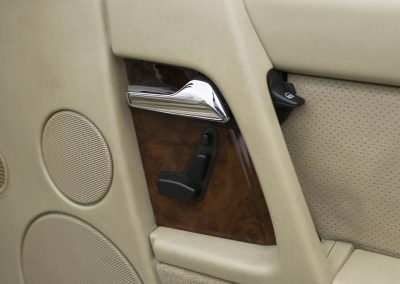 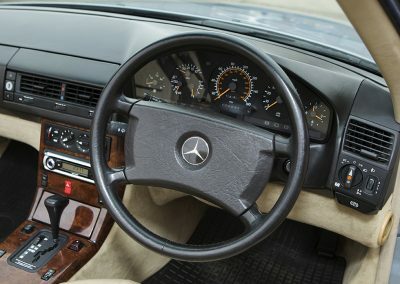 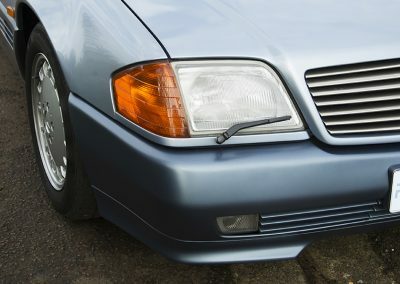 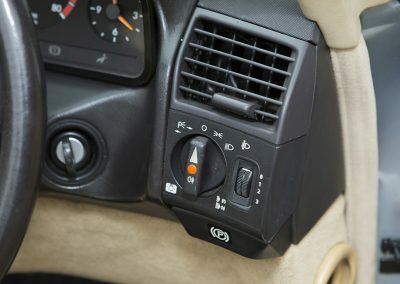 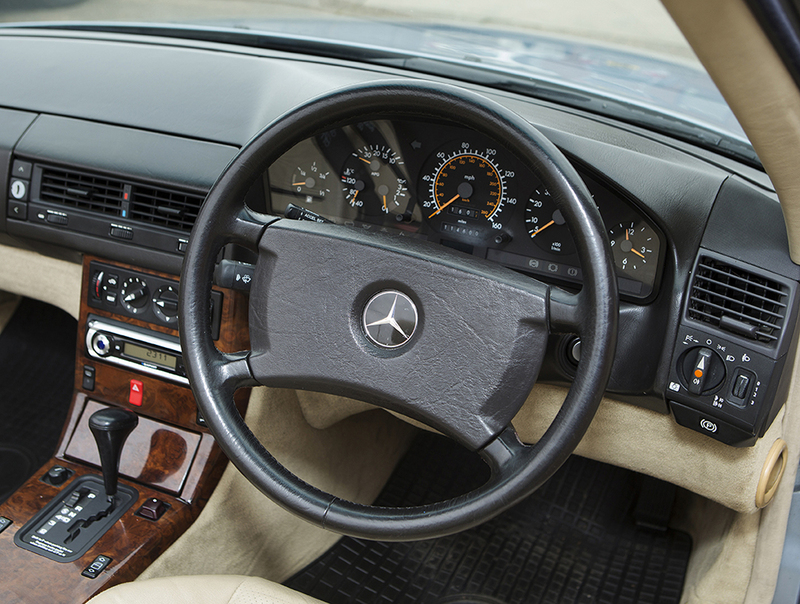 This Mercedes has the following equipment. 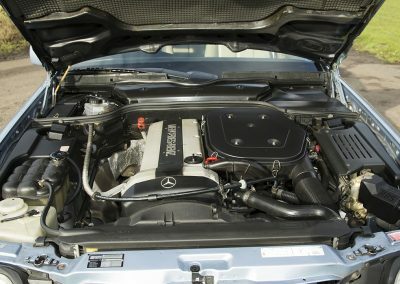 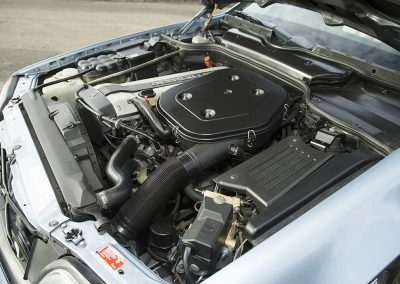 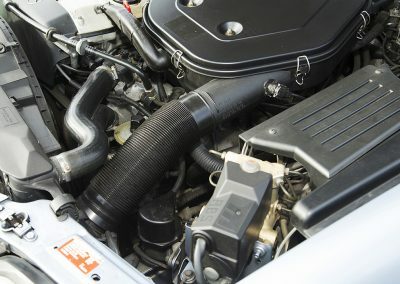 The three litre 24 valve engine produces 228 BHP and is mated to a very smooth 5 speed gearbox which was very advanced when the car was launched. 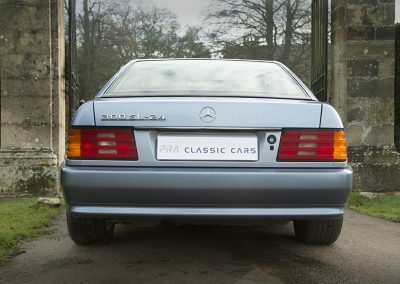 It gives Sport and Economy settings and complements the refined 6 cylinder engine and makes for rapid if not blisteringly fast progress when required. 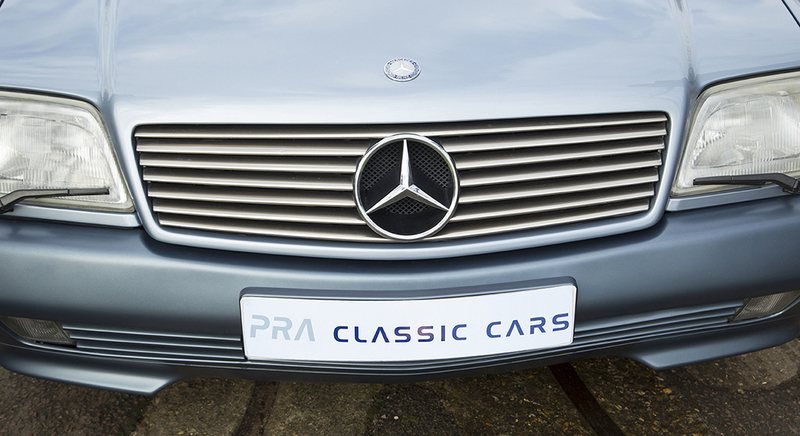 The performance figures for the day state a maximum speed of 146 MPH and a 0-60 MPH in around 7.9 seconds. 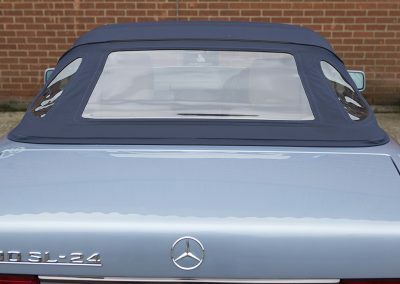 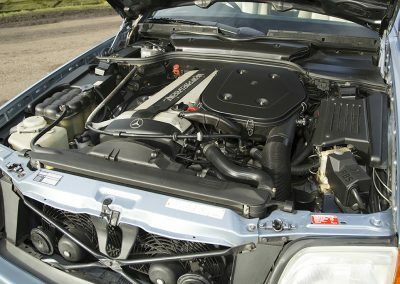 In what is a heavy and massively over engineered car which this generation of Mercedes is famed for the SL excels as a Grand Tourer. 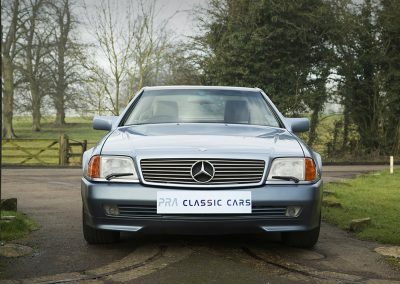 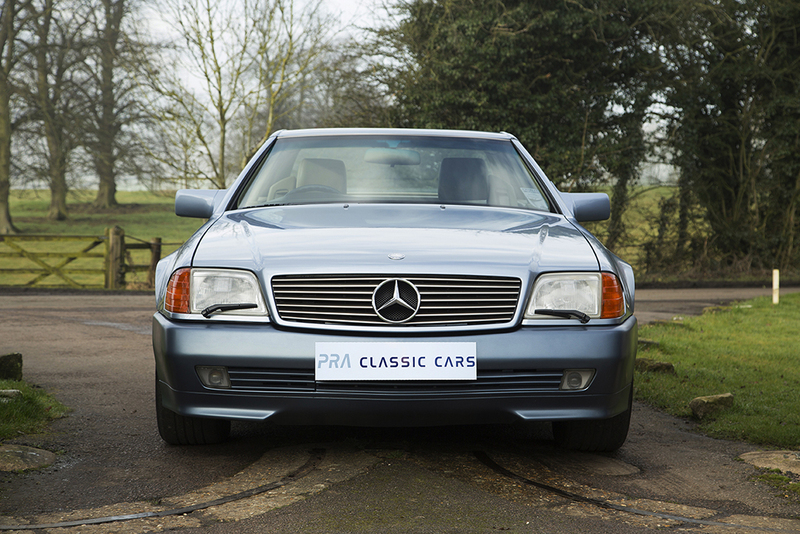 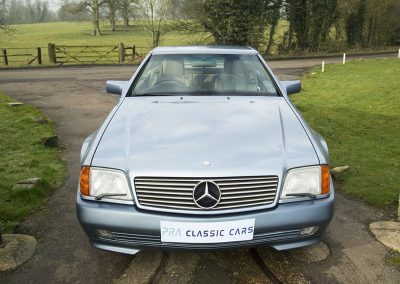 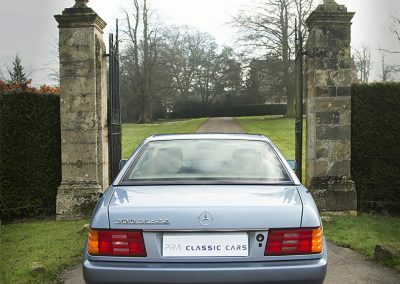 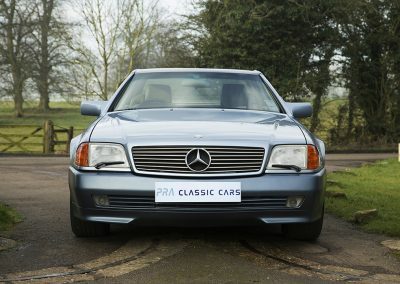 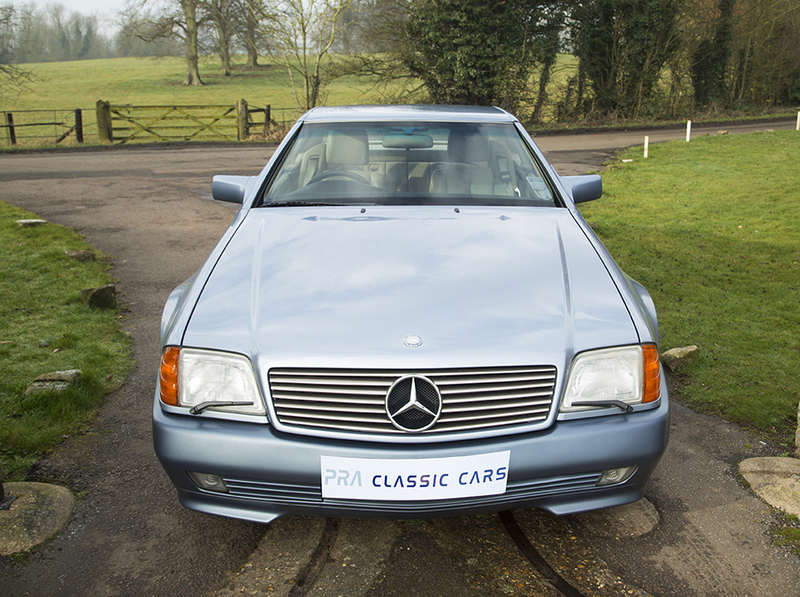 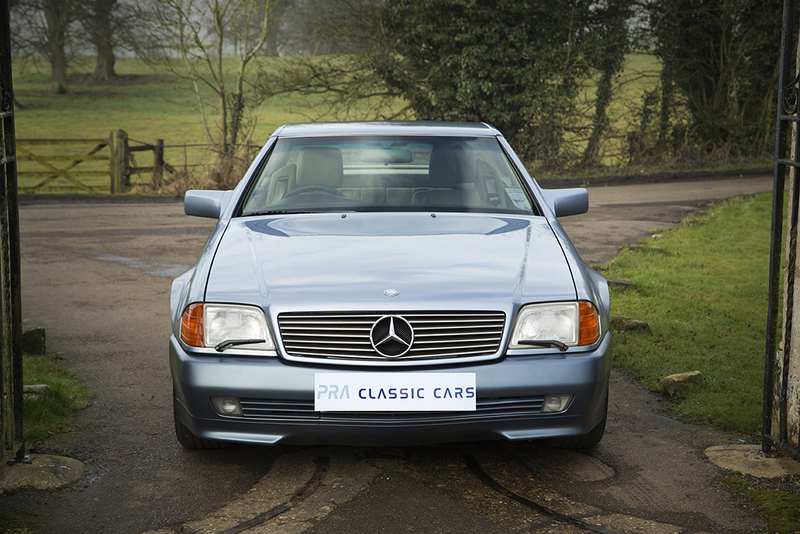 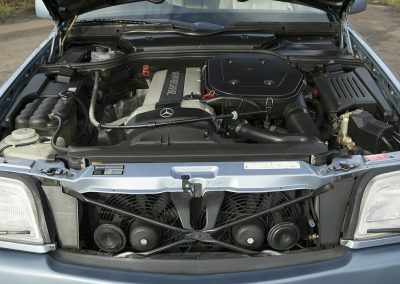 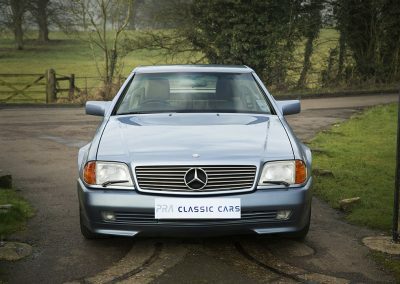 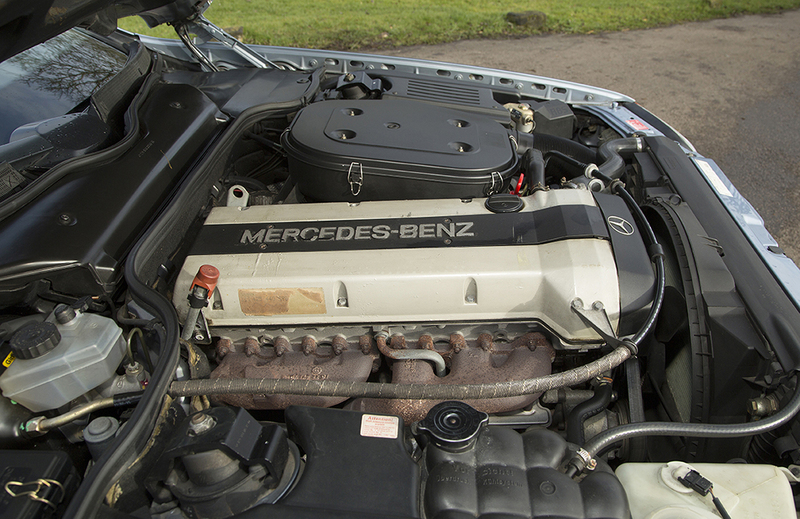 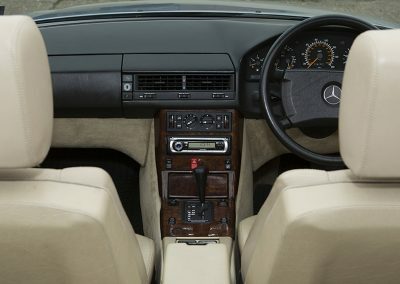 With relaxing and stable handling, a super smooth engine and a seamless gearbox this Mercedes is a wonderful car to drive.